As mentioned in my last post, I was expecting a couple of items in the post for my upcoming Big Walk. Both arrived over the past few days. One is a luxury item that I regard as an essential part of recording my forthcoming experience, the other is simply to keep me warm. Three Points of the Compass has used an Olympus Tough TG4 on my past few walks, be they short or long. 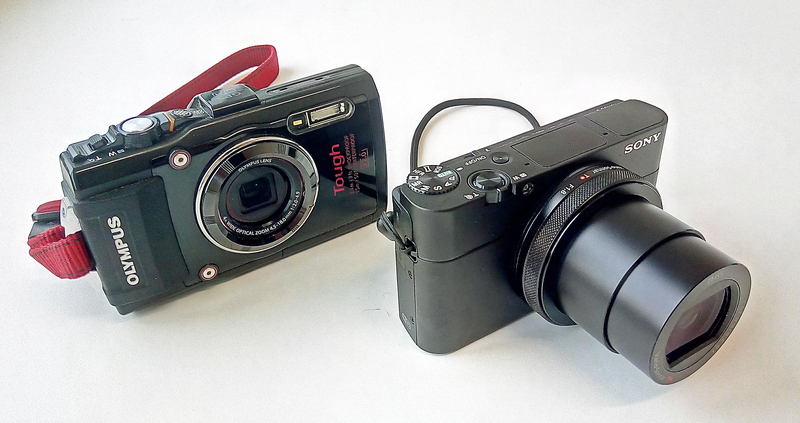 This has proved to be a fantastic camera and is still going strong. With wrist strap, battery and SD card fitted, it weighs 252g. Though annoyingly, it requires a proprietary charge cable to be also carried, adding a further 49g to pack weight. 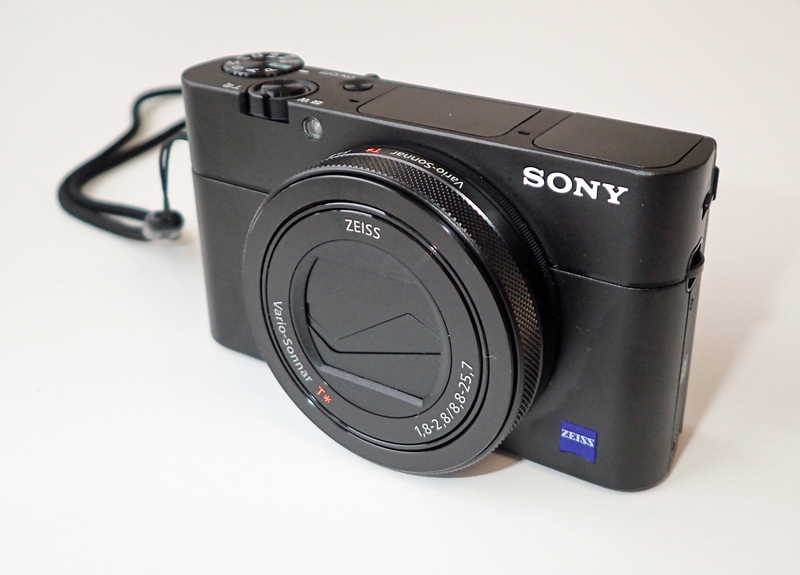 For this little adventure of mine in twenty days time I decided that the quality of the photographs I take is of greater significance than before so decided to step up in camera quality and use a Sony DSC- RX100M5. I want the best possible memories so I am taking the best possible camera I can that is still relatively lightweight and of small dimensions. I won’t bore you here with the detailed specs but important to me amongst a number of desirable features are the build quality, the 1″ sensor, 20.1 Megapixels, 24-70mm F1.8-2.8 lens, fast focus, capability to film in 4K and its small size. Oh yes, and you can charge it with a standard USB/micro USB cable. 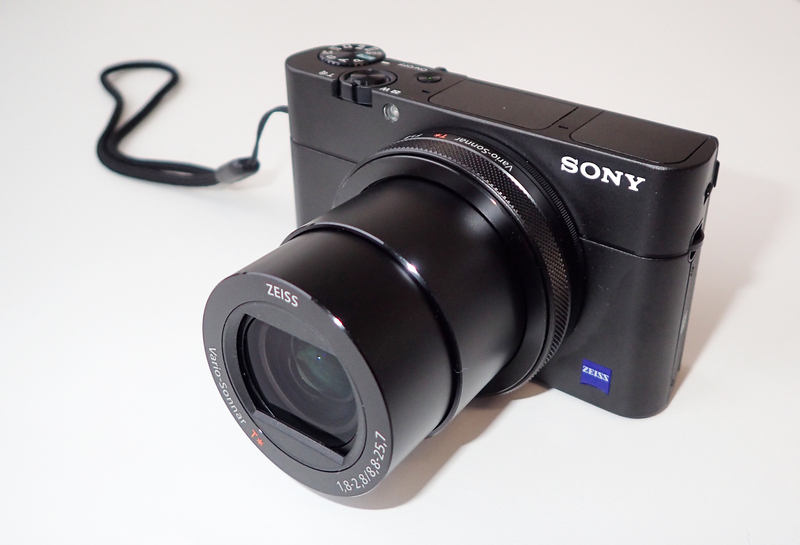 I have made no great weight advantage by switching to this camera, with the thinner wrist strap fitted, and battery and SD card, the RX100M5 weighs 298g. I do wish it had some degree of weather protection like the Olympus Tough, but no, it isn’t going to take kindly to precipitation. If it is wet and I want to record something, I shall have to put my RugGear RG730 phone in to action. That is IP68 and pretty much laughs at any sort of punishment. I normally keep a camera in my packs hip belt pocket but have decided to offer a little more protection for this camera. 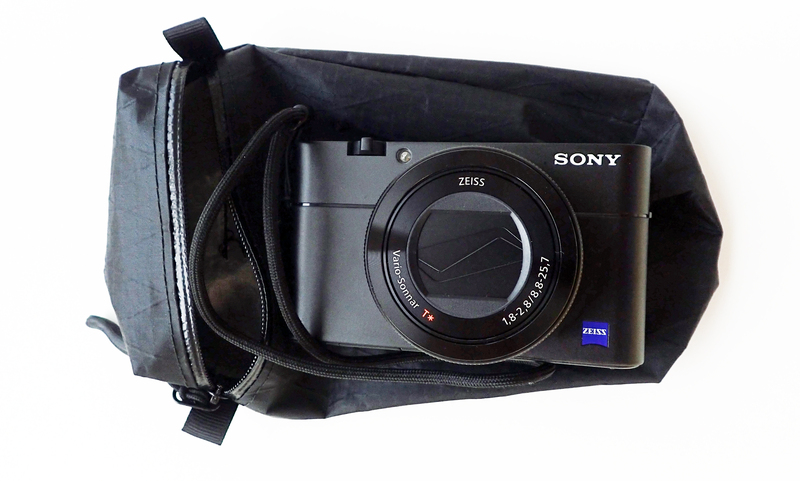 It shall be kept in a poly ziplock inside an 18g camera pouch fixed to the shoulder strap. This is made by Tread Lite and is yet another recent arrival with the post. 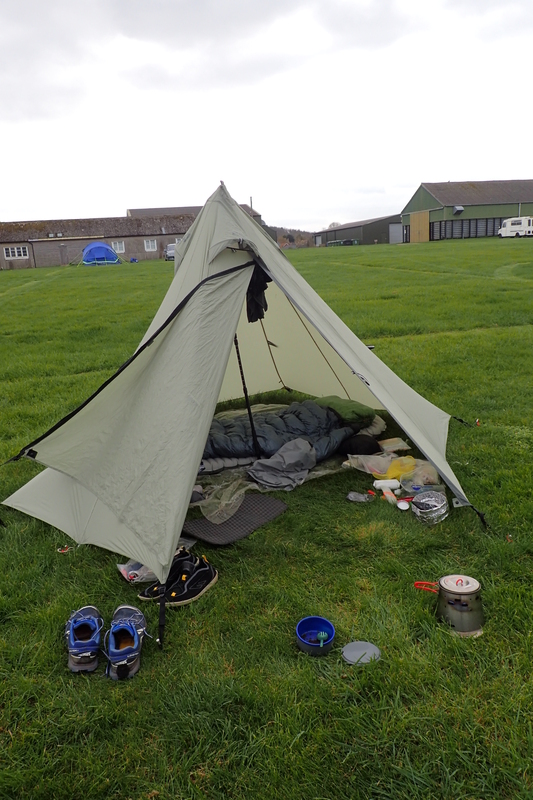 On many an occasion, I have finished a day’s hiking in the rain, tent up and climbed inside with soaked through trousers. It is important, nay, vital, to get out of those wet clothes and warmed up. Sometimes climbing inside the quilt is required. 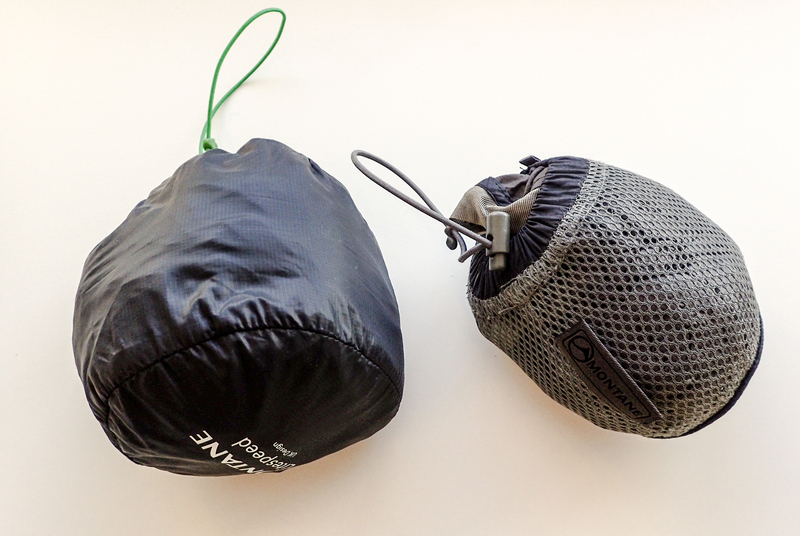 Like most long distance hikers, Three Points of the Compass carries a puffy jacket. 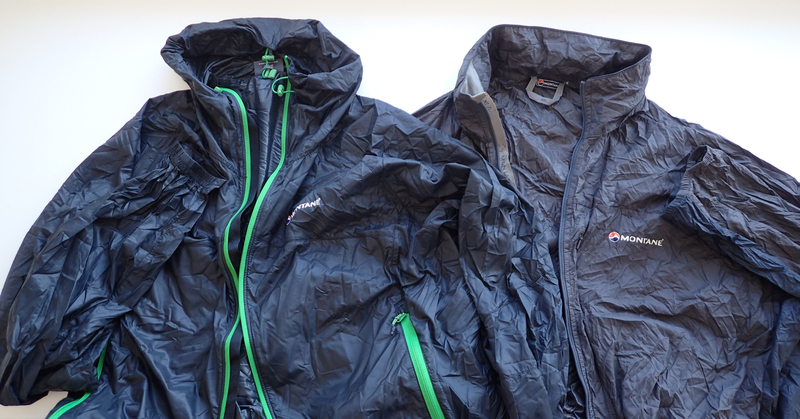 For this upcoming trek I am taking a synthetic jacket, the Rab Xenon X Hoodie. I don’t like to rely exclusively on down in the UK. 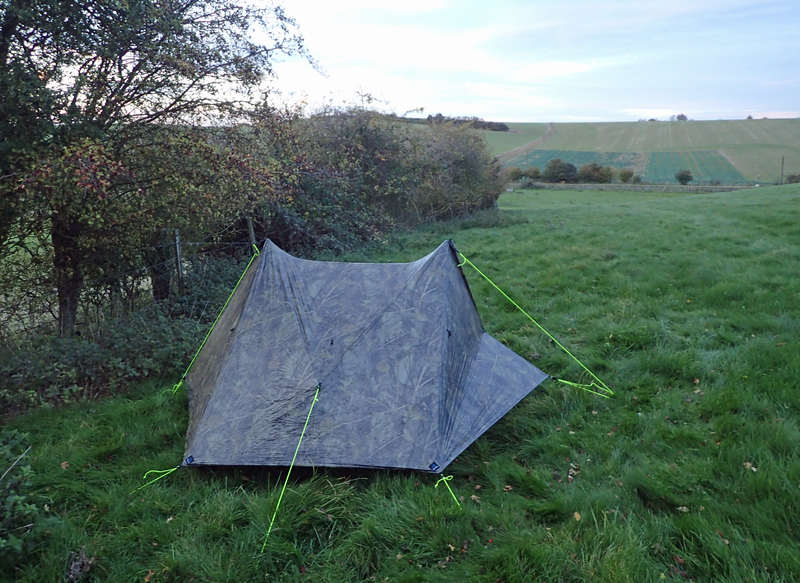 We frequently have wet weather for days on end and even with the hydrophobic down available today, and my Katabatic Palisade quilt is stuffed with it, synthetics will still handle a real soaking much better. 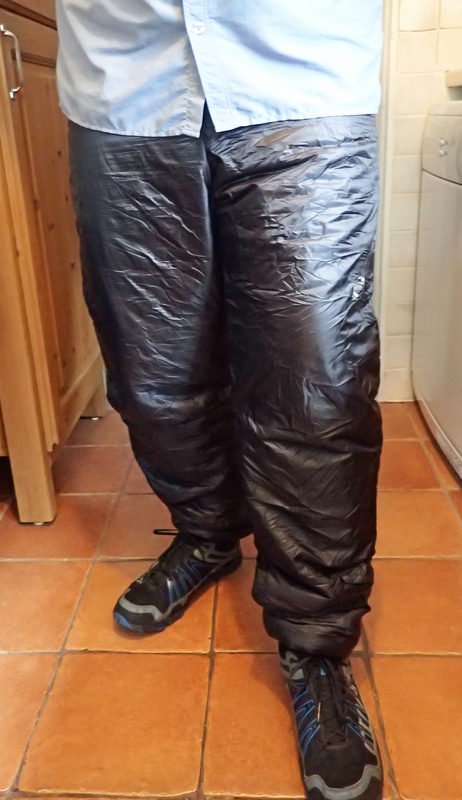 I have decided to add to the jacket and take a pair of trousers with synthetic insulation. 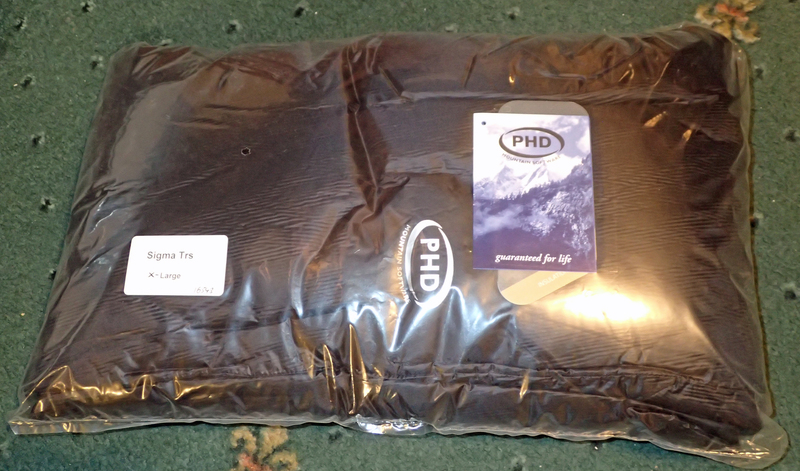 For these, I turned to one of the best suppliers of down and synthetic clothing I have come across- Peter Hutchinson Designs, or PHD. A week after my order, a package arrived at Mrs Three Points of the Compass’s work place. If she was expecting a sweet little gift, she was probably disappointed. The Sigma trousers from PHD are fairly simple in design. Inner and outer fabric is black 15 denier MX. 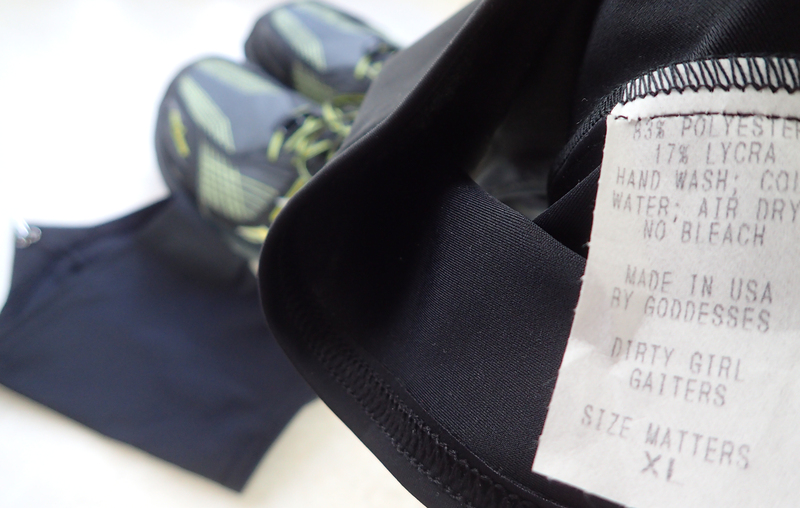 The insulation is provided by Primaloft Gold 60gsm edge stitched synthetic filling. There is a chunky draw cord at the waist, elasticated ankles to keep the draughts out and the only pocket is a small inner security pocket to the right of the waist. The trousers themselves weigh 360g and also came with a 16g stuff sack but I’ll be able to find something lighter than that to keep them in. This entry was posted in Gear, Uncategorized and tagged camera, Clothing, gear on March 12, 2018 by Jools. 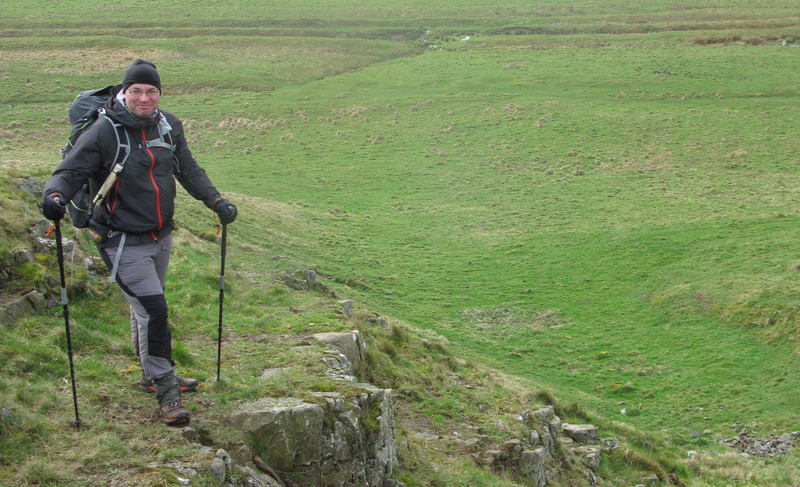 The picture above shows Three Points of the Compass and daughter hiking Hadrian’s Wall in 2014. Together with Mrs Three Points of the Compass we experienced a typical mixed bag of weather on that six day April walk. An important factor for me to consider when I set off on my ‘Big Walk’ in thirty days is the weather. 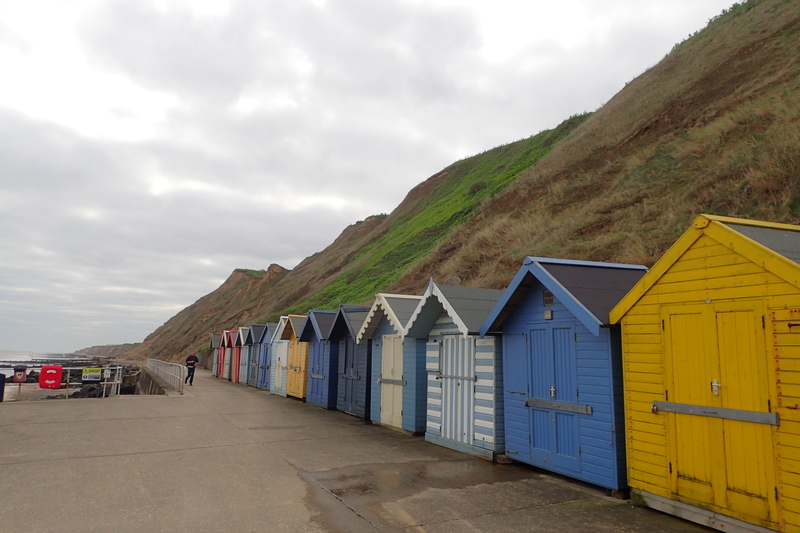 In Britain, at that time of the year, I can encounter just about any type of weather. I may hope for cool days with little wind, but will almost certainly be presented with cold, wet, or hot (well, very warm) conditions. Such changeable weather means that my clothing and equipment will have to be capable of handling extremes. As I write this, much of the UK is gripped by the ‘Beast from the East’. This is simply a polar vortex spiralling in from Siberia. Much as I would dearly have liked to go hiking, I have had to work over the past few weeks. Commuting has been ‘interesting’ to put it mildly. Temperatures haven’t risen above 0°C for most of the week and have usually been a fair bit below this, especially taking wind chill in to account. 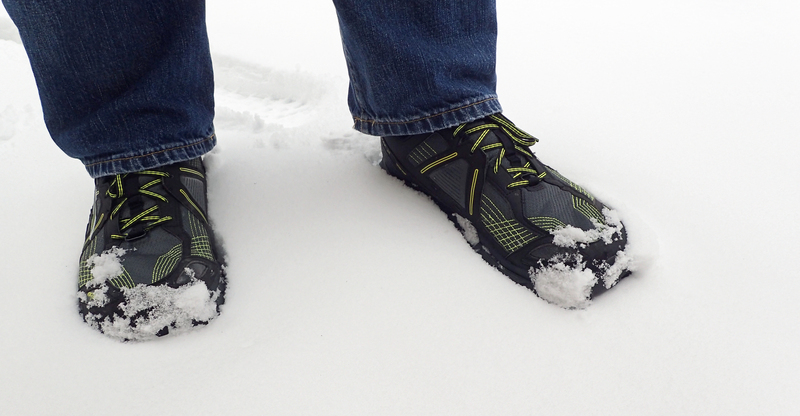 I could have dug out my battered old Brashers for the commute but instead decided to see how the new Altra Lone Peak 3.5’s tackled ice and snow. I am pleased to find that the sole pattern and grip on these is as good as any other trail runners I have had in the past, possibly with the exception of my Inov8 330s. While I don’t expect to have to contend with snow in the West Country in thirty days time, I do expect to encounter slippery conditions. That said, it is just as likely to be sunshine I experience in the early weeks of my hike. So despite the snow outside, I spent a few minutes this week decanting sunscreen from a larger plastic container into two smaller plastic bottles. 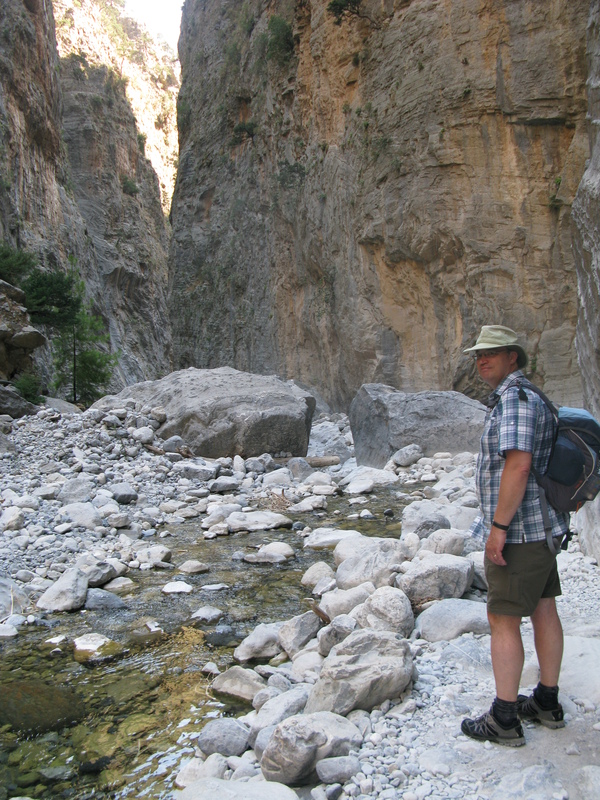 I frequently wear a Tilley Airflow hat when hiking, whether sunny or raining. However I do find the backs of my hands especially can catch the sun when hiking with Pacer Poles. 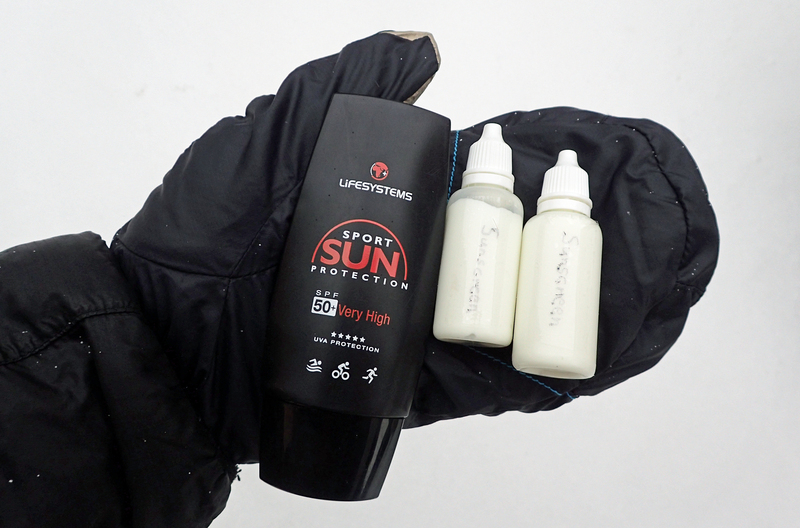 The 50ml bottle of 50 SPF sunscreen from Lifesystems weighed 67g when purchased. 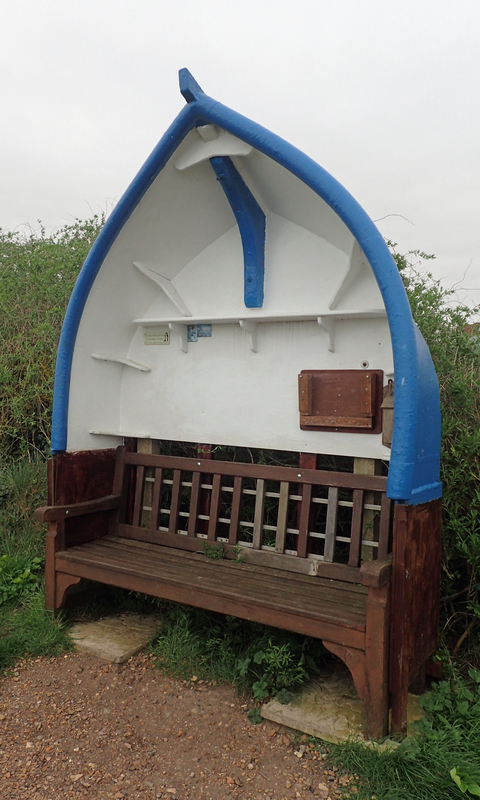 When I set off from Poole on the south coast of England on 1st April this year, I’ll be carrying one small 5g bottle containing 18g of sunscreen (total weight 23g). I also have another bottle with 24g of sunscreen ready to be posted to me as, when and if I require it. This is a pretty good sunscreen, with one application lasting up to six hours. 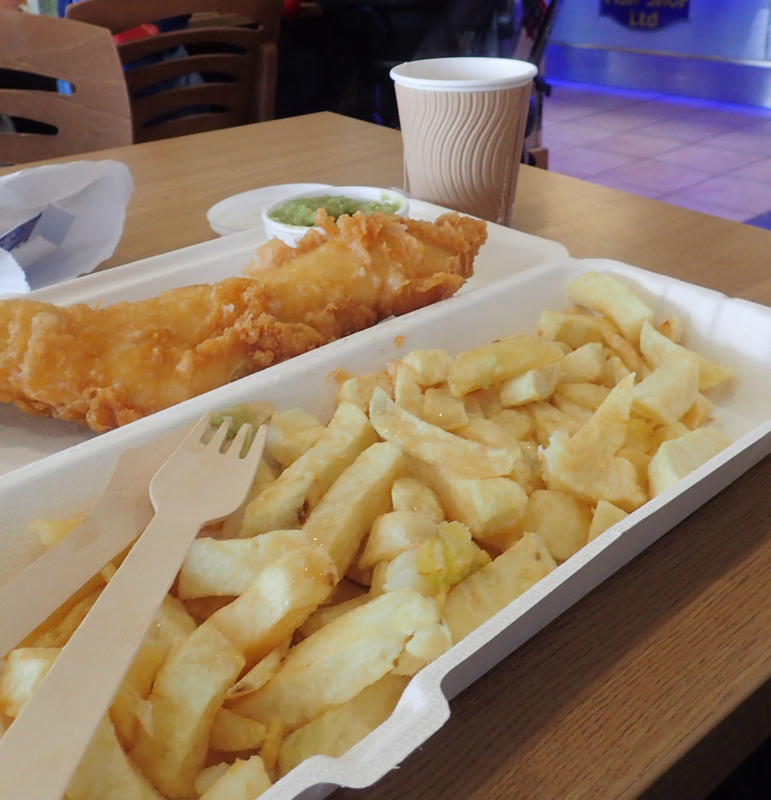 I usually prefer Piz Buin as I find that less greasy but the one from Lifesystems offers added protection from Jellyfish stings, I am sure that will come in handy…. 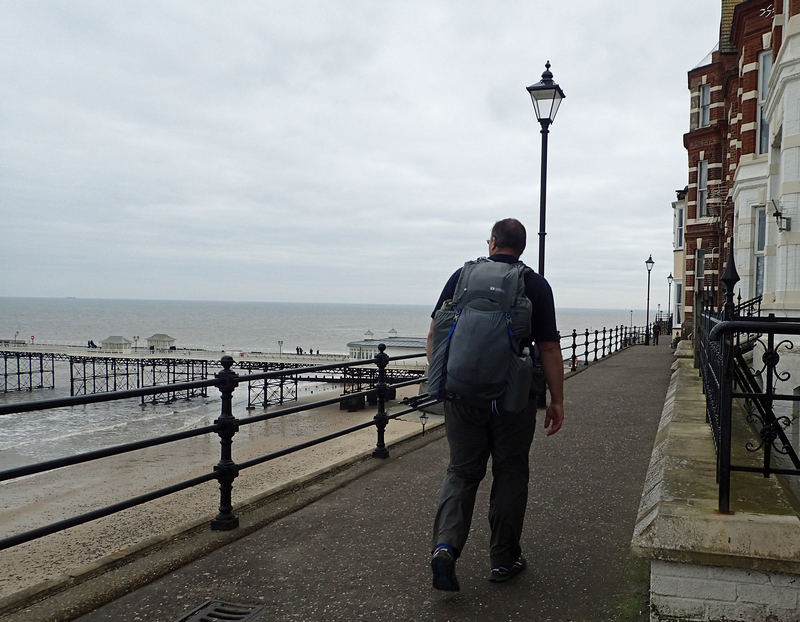 This entry was posted in Gear, Planning, Uncategorized and tagged Clothing, feet, gear, Knowledge, Norfolk Coast Path on March 2, 2018 by Jools. I’ve been waiting for this delivery. I won’t say that I was worried, but I have certainly been very conscious that time is ticking down to the start of my hike. As I write this I have 52 days to go. This morning I emailed a company from whom I had ordered (and paid) for three pairs of trail shoes some weeks back. At the time, they had quickly told me that there were supply problems not only to the UK, but Europe in general. I’ll wait I replied, as I say, I’ve been waiting a while for this delivery. I have worked through a number of different types of trail shoe over the past few years since I made the switch from boots. I couldn’t get on with the Salomen XA Pro 3D, the heel cups fell apart after less than two hundred miles. Inov8 did me well for a while, the 295’s and 330’s were good, with lovely traction, but they messed around with the design and they proved less suited to my feet. Again, the heel cups fell apart after too short a period. Then I switched to Brooks Cascadia 8s. 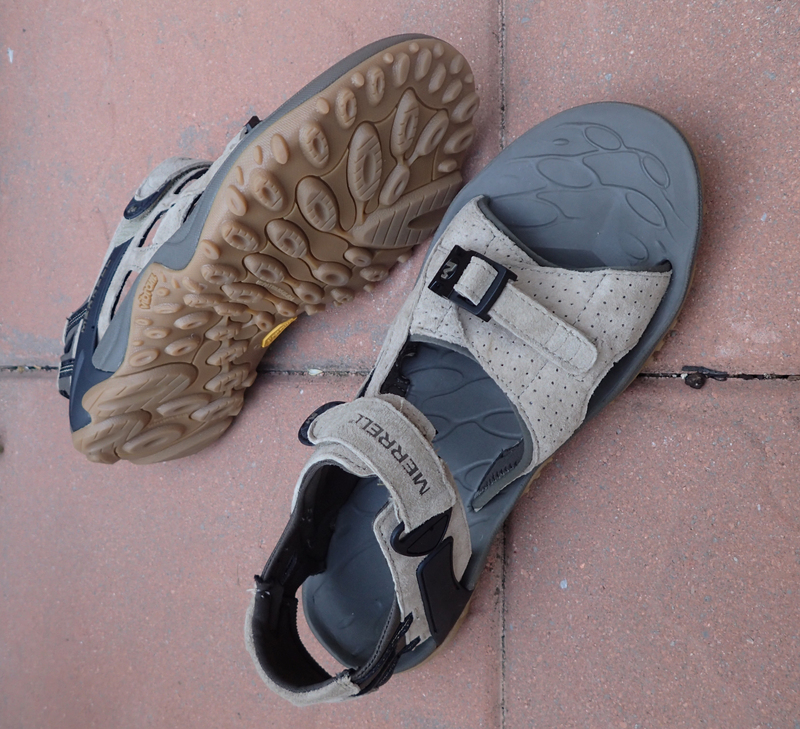 I loved the wider toe box and the heel cups were more robust, never wearing out. But the material across the top and sides of the feet wore through after less than three or four hundred miles. I expected better. 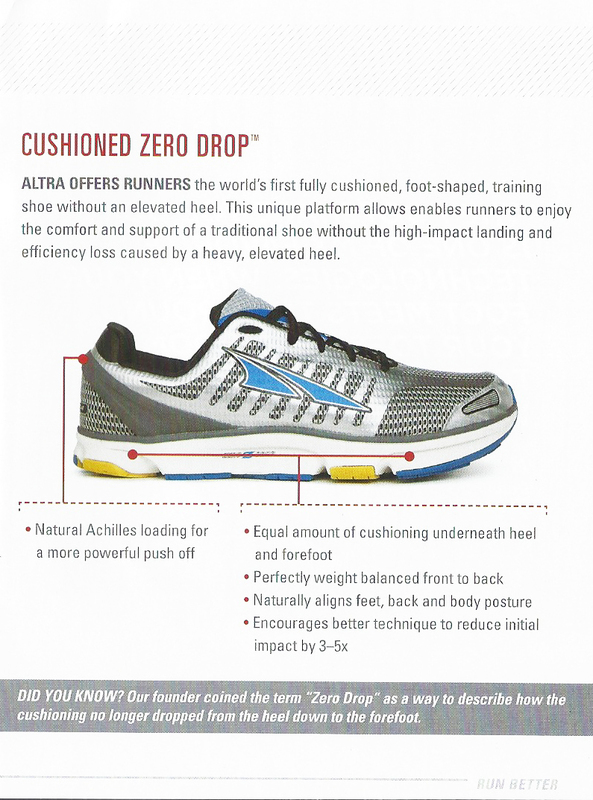 So I made the change to a pair of Altra Lone Peak 2.5 and thought ‘at last’, I’ve found them! 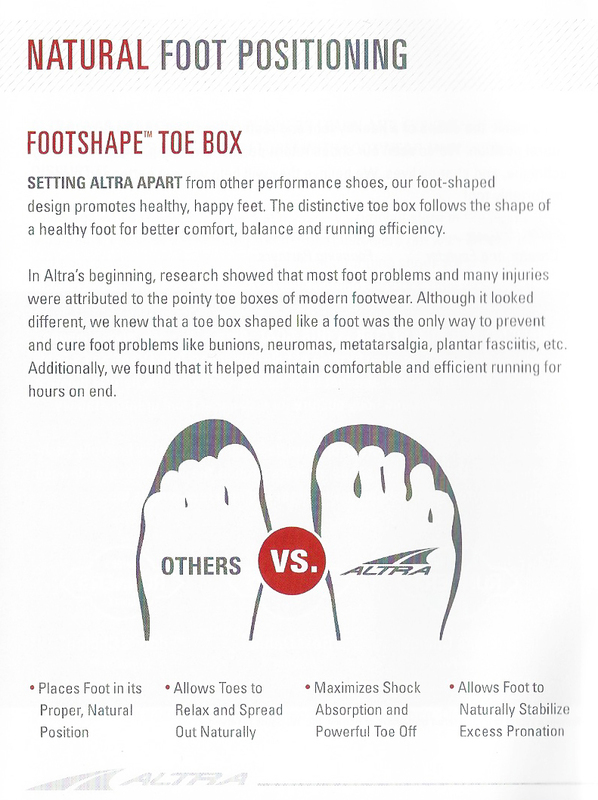 I loved the wide toe box, even if it did look like I was wearing a pair of shoes designed for a circus clown. I could get five hundred miles plus out of a pair with no splitting of uppers, the heel boxes held together. Traction wasn’t fantastic, but I could live with it. Also, I found the zero drop to my liking. So I happily changed to the 3.0’s when I had to. They were just as good and the changes had not detracted from the shoes. I have found that the inner sole starts to wear at the ball of my foot after six hundred miles, so I need to be careful to switch out prior to that. When I was making my final gear choices for my upcoming hike, it was toward the 3.5’s that I turned. However they have proved somewhat difficult to source. After more weeks that I am strictly comfortable with, I received a text from my wife this morning to inform me that they had arrived at her work place. 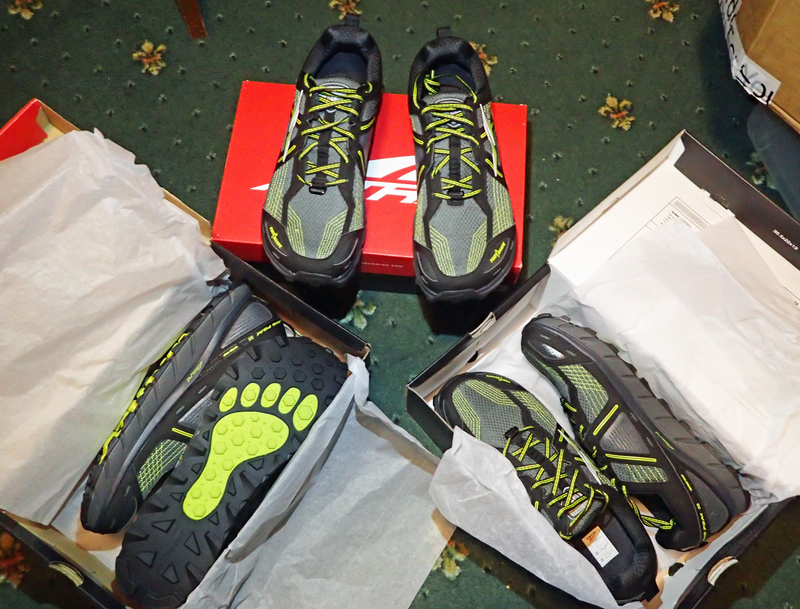 I am now set with three pairs of Altra Lone Peak 3.5’s in UK size 12 (US 13). Each pair weighs 730g, or 805g including my orthotic inserts. Needless to say, some changes have been made- new drainage holes, I am fine with that. 4-point gaiter system, I only require the two for my Dirty Girl gaiters so fine, that doesn’t bother me. Also an upgraded upper mesh, I am pleased with that change. The soles are unchanged. These trail shoes will do me well I believe. Manufacturers seem to revel in messing about with the design of successful products, especially trail runners, but the 3.5’s seem to have retained all that I like with a couple of OK upgrades. The design has also changed in that they don’t look so ‘clownish’ now. They still have the same width in the toe box, as evidenced by comparing the insoles from 3.0 and 3.5, but devilish things seem to have been achieved by the designers in the latter shoe’s appearance. This entry was posted in Gear and tagged Clothing, feet, gear, Trail shoes on February 8, 2018 by Jools. 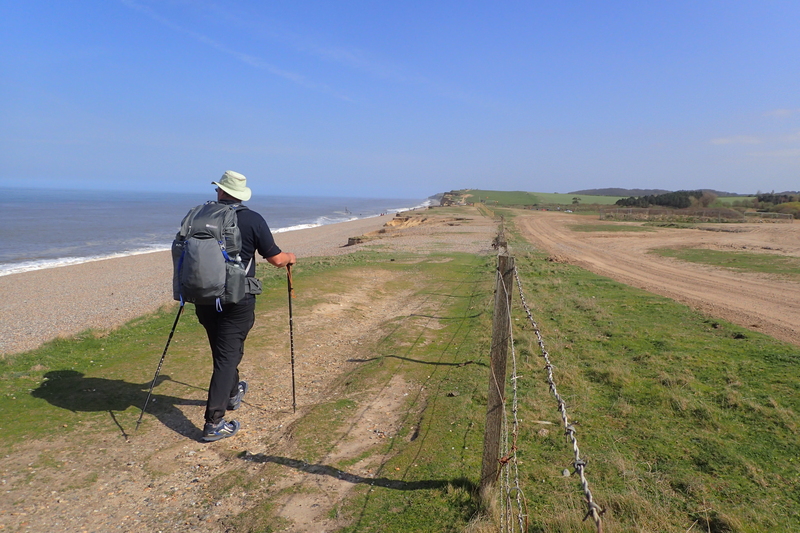 As the time approaches for Three Points of the Compass to set off on the Long Walk, I thought it wise to fit in another week or so walking with, more or less, the gear that I am planning to set off with on April 1st 2018. Some contents of the pack have altered since last I hit the trail for any distance, not least, my tent. I’ll chat about a few of those items in a follow up post in a week or two. 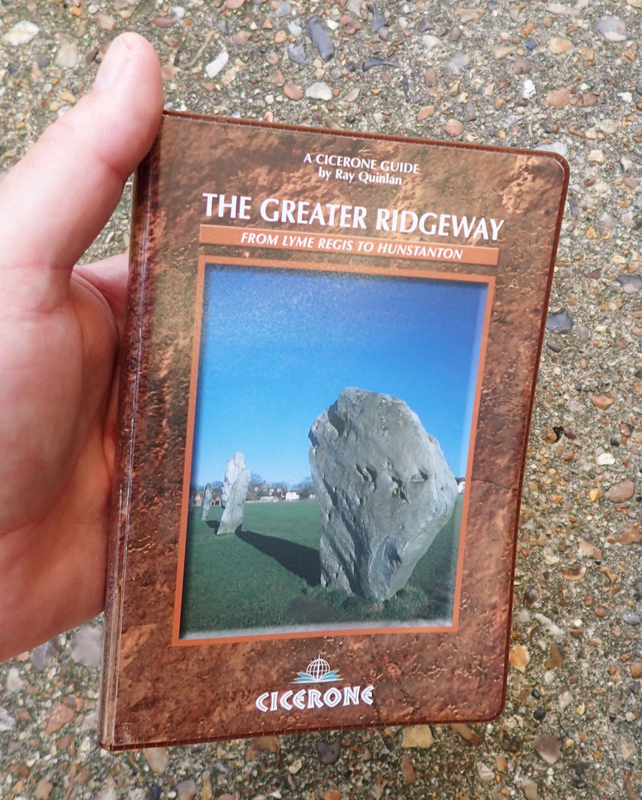 I walked The Ridgeway in May 2016, and the Peddars Way in April this year. These form part of The Greater Ridgeway which stretches for some 363 miles from Lyme Regis in Dorset, to Hunstanton, on the North Norfolk Coast. 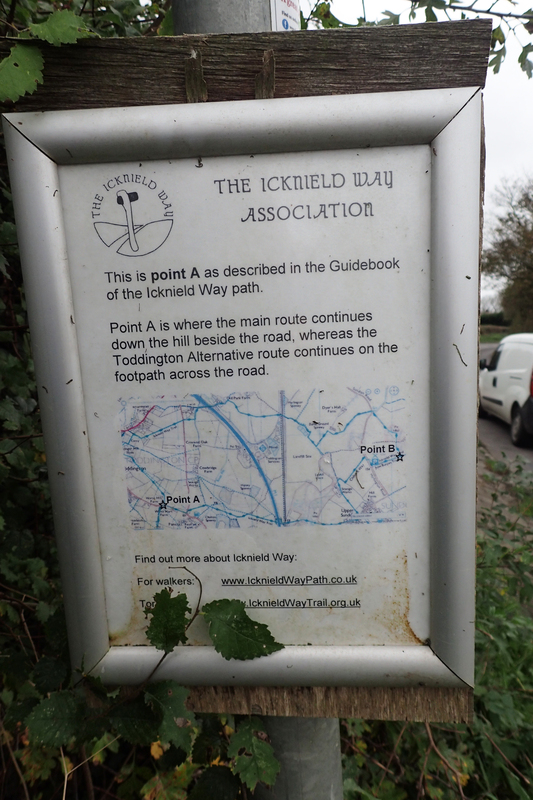 The Icknield Way Trail formed another link. Being around a weeks walking, it was perfect for an autumn excursion. 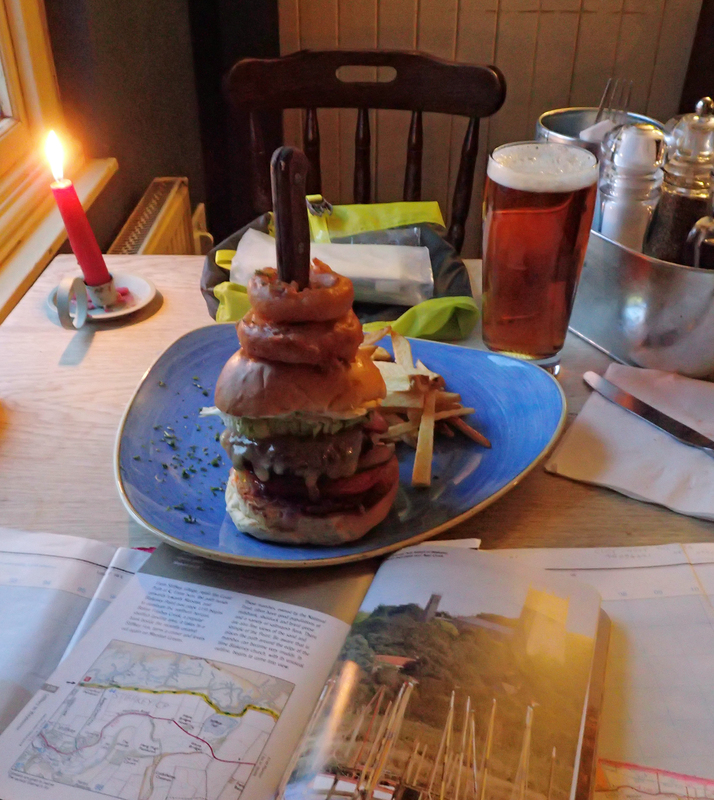 Mind you, this did not go down particularly well with Mrs Three Points of the Compass as we had just returned from a fortnights holiday in Cyprus (more on that in another blog). While she had to return to work, I fortunately found myself still with a weeks annual leave to take. So a weeks walking it was. 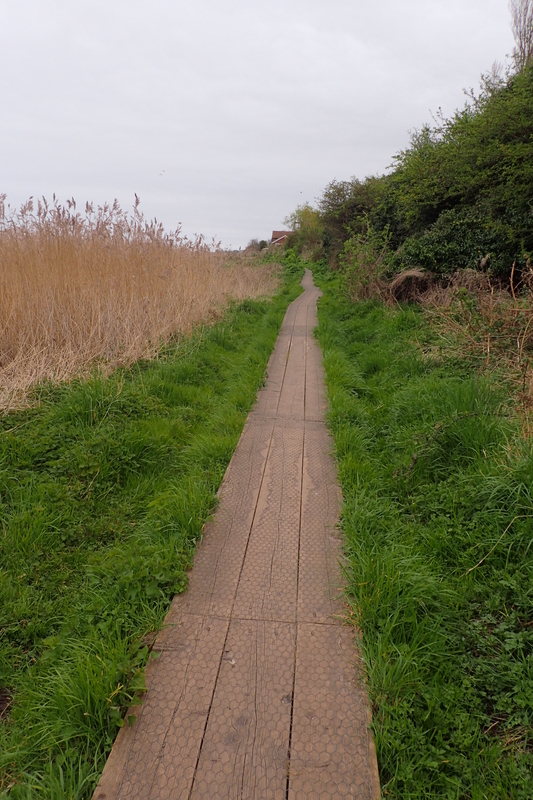 There are differing lengths to be found for the Icknield Way Trail in publications and online, varying from 98.5 to 110 miles. 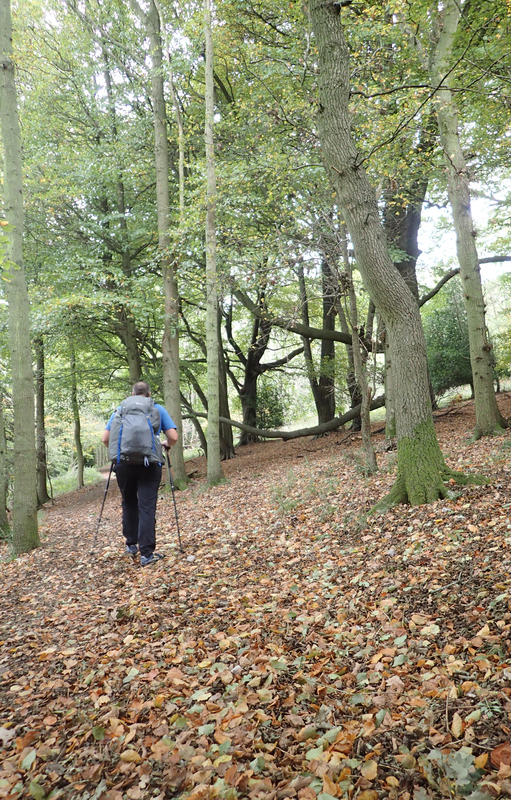 For this walk, I set off from Tring Railway station, Hertfordshire, where my Ridgeway walk had ended, the morning after completing that trail at Ivinghoe Beacon in 2016. 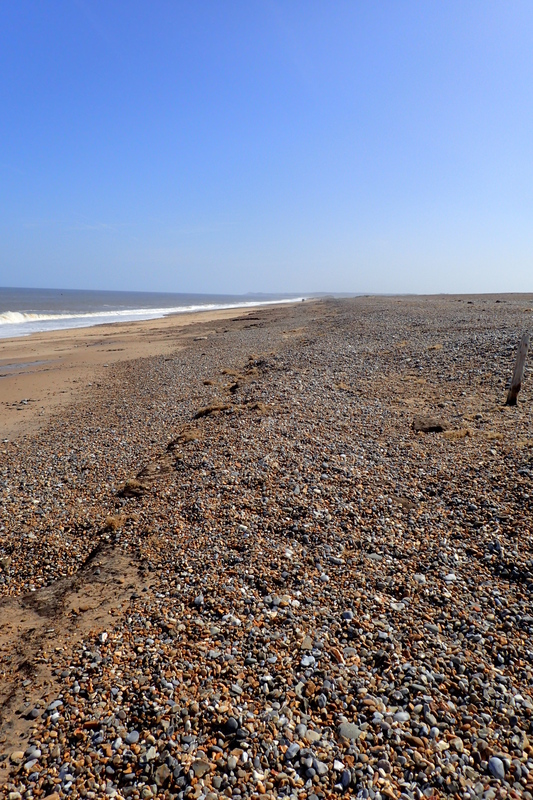 This autumn, I finished walking six days later at the lonely carpark on Knettishall Heath, Suffolk. My total, with a bit of wandering, just a little exploring and not getting lost (sorry, momentarily unlocated) too much, was 120 miles. 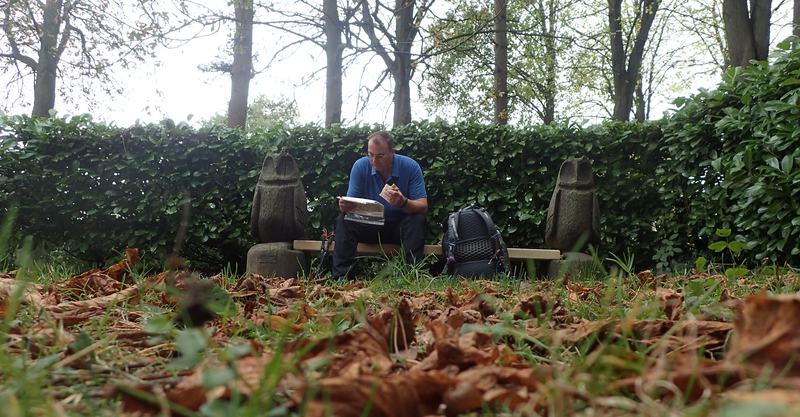 I deliberately carried out little planning, as I wanted to get a better idea on how days might pan out on my longer walk next year where planning will frequently be day-by-day. 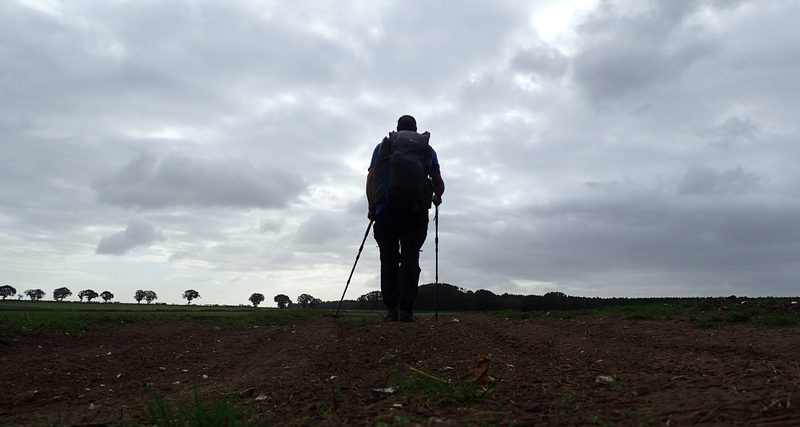 I allowed myself eight days for the Icknield Way Trail, not really caring how long the walk took. In the end, it was six, finishing a little before 13.00 on the final day. In truth, I probably pushed myself too much, I am still recovering from Plantar fasciitis after all. 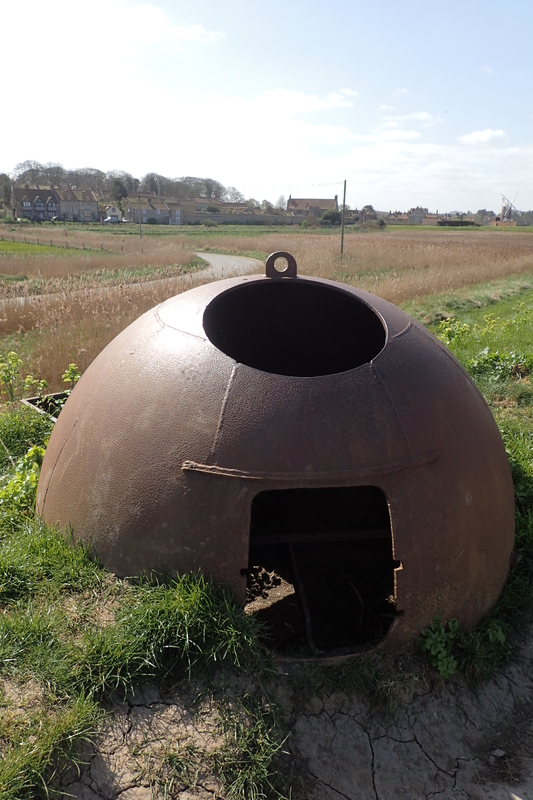 I did get the occasional twinge from that on my walk. I would certainly aim at much lower mileages next year. I carried plenty of food, enough for six days. 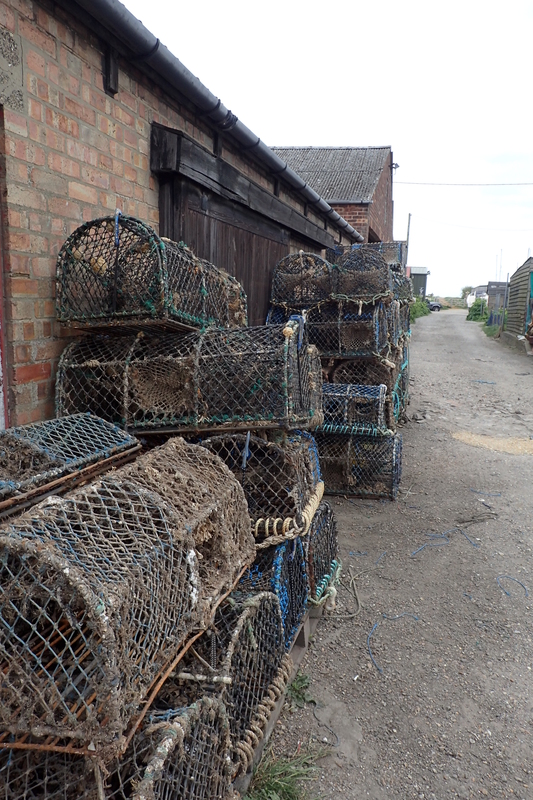 This was shop bought, mostly low bulk, low weight. 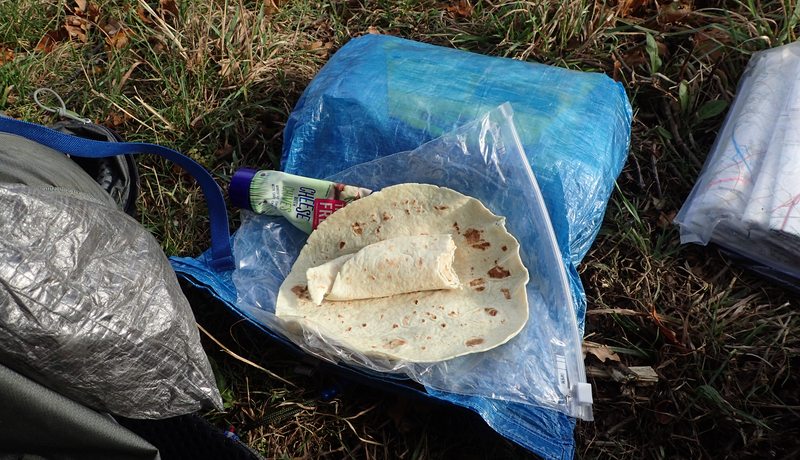 I never took any sort of specialised, dehydrated ‘backpacking’ food. Again, to see how both myself and my pack handled the extra weight and bulk. 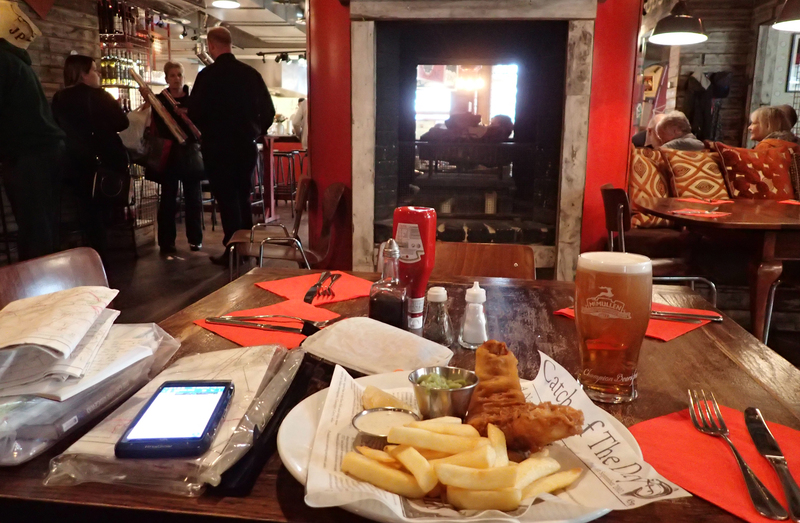 Needless to say, some uneaten food returned home with me afterward, mostly due to my eating a couple of meals in pubs en route. 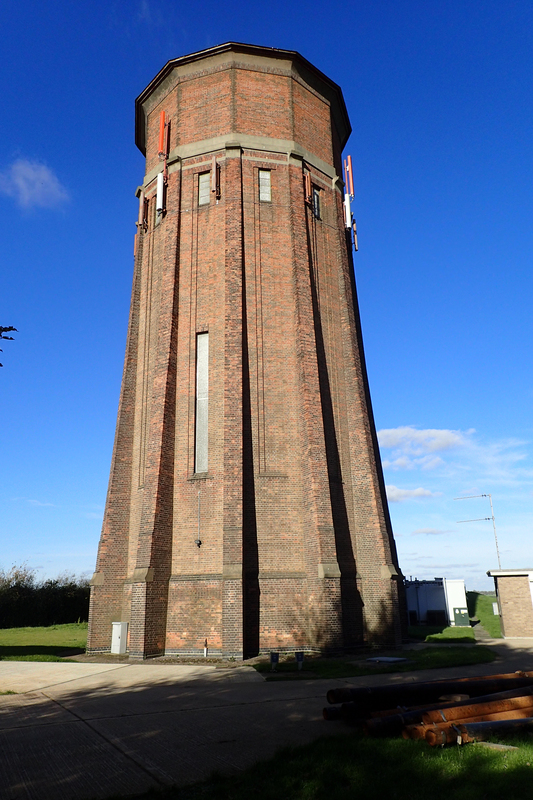 On Rivey Hill, Cambridgeshire, the Icknield Way skirts a substantial brick built, 12-sided, water tower. 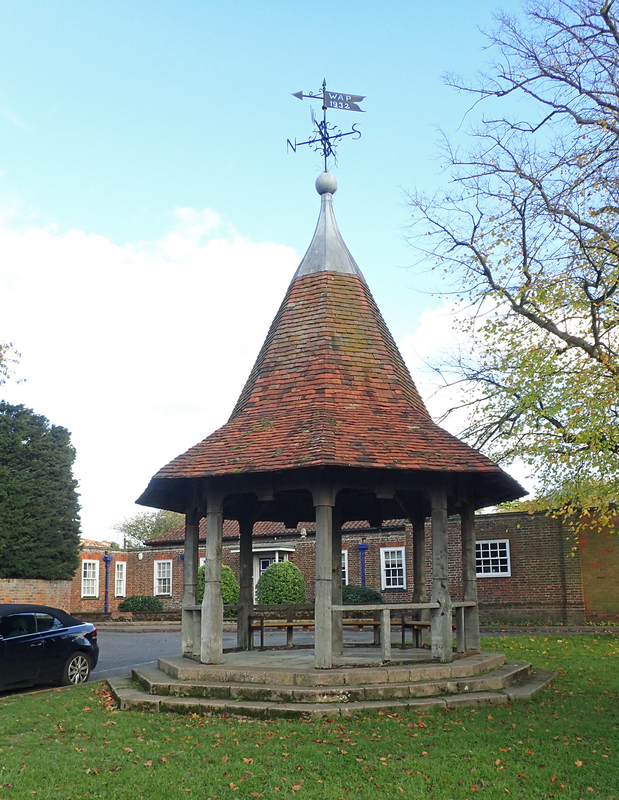 This Art Deco tower used to provide water for 5000 people in nearby Linton and neighbouring villages. 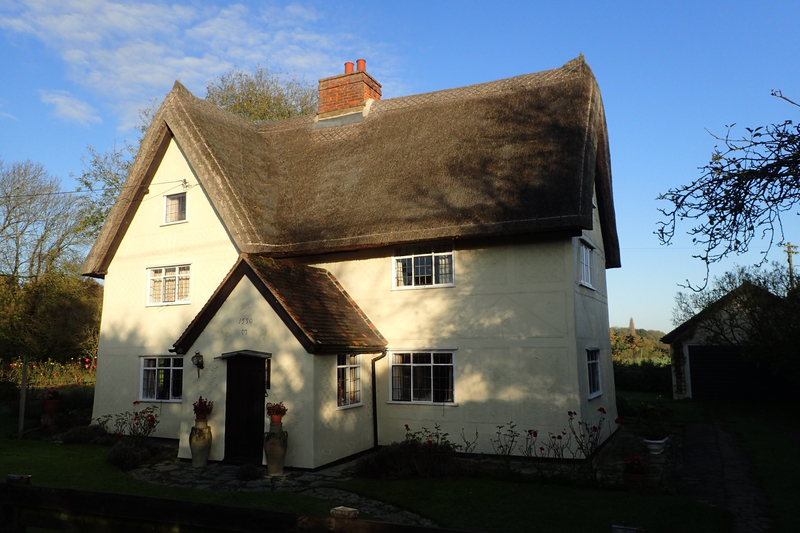 Constructed in 1935-6, this is now a Grade II listed structure. Despite being a marked route on O.S. maps, this is a little followed route. I only met two others walking the trail, and the two ladies were doing it together, in sections, over many months. There are few places to officially stay, be it camp sites or B&B. Purposely, I wild camped on each of the five nights on trail. None of my sites were planned. I would walk each day, look ahead on the map between midday and 14.00 and from around 16.30 begin to look for a place to hide myself away. At this time of the year, day light hours are few, light was failing at 17.30 and was dark an hour later. I was invariably up prior to dawn, packed and walking by seven. 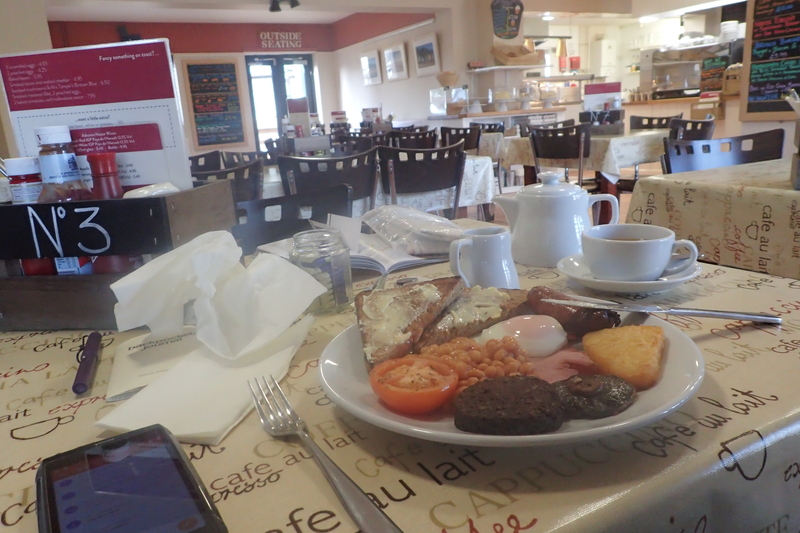 I stopped for a hot breakfast of porridge some two to four hours later. I was disturbed on a couple of the nights. My halt on the first night coincided with a bunch of young lads from the nearest village turning up to let off fireworks for 45 minutes, what great fun… My second night had a pair of gleeful herberts hurtling up and down a nearby track (on the other side of the hedge in the image above) on a quad bike, lamping. Fortunately I remained undiscovered. 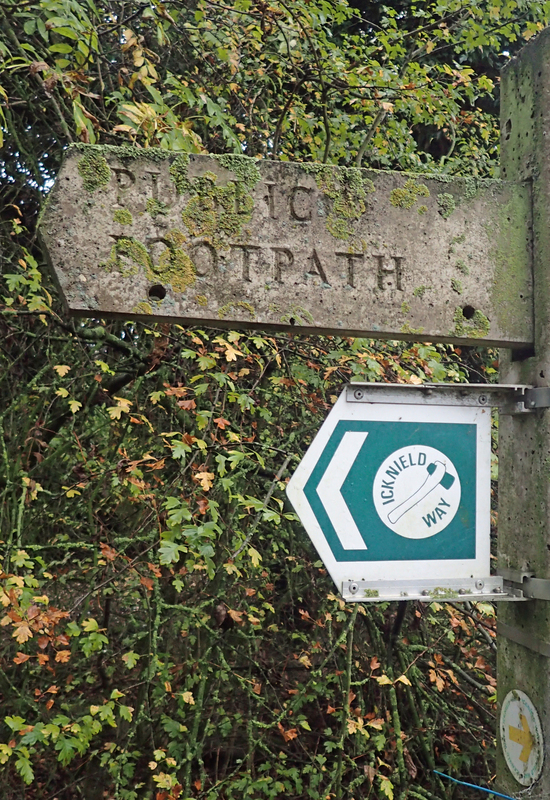 The Icknield Way Trail may be a little confusing to some. Most authorities would describe it as a collection of parallel track ways connecting Avebury in Wiltshire, with the north Norfolk Coast, around the Hunstanton area. The way follows the geology- a band, or spine, of chalk stretching across the country. Where the going became tough for our ancestors, usually due to thicker vegetation emanating from the clay covering of the chalk, they switched to a lower level. Much of the route is Ancient with some having been ‘improved’ by the Romans. For my section, much of the old route has now been consumed by the A505. Where it remains extant, some of the older track way is indicated on O.S. maps by Gothic lettering. Today, we have a choice of routes to follow. 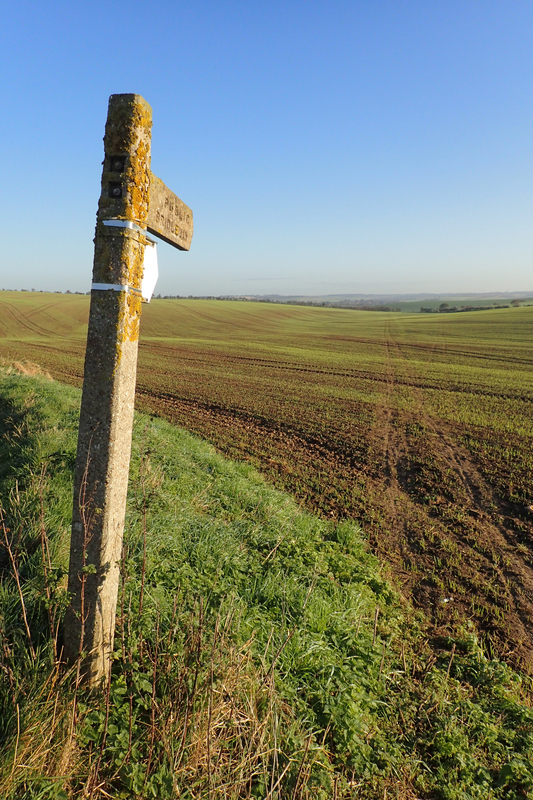 There is the walkers route- the Icknield Way Path, as described by the Icknield Way Association, there are also occasional variants from the walkers route for cyclists or horseriders (the Icknield Way Riders Route). 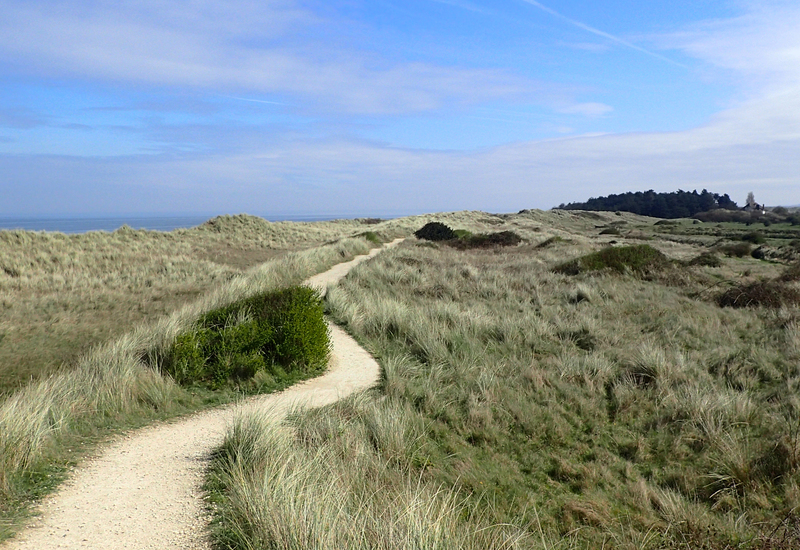 To further confuse the user, there is even the occasional choice of routes for the walker. 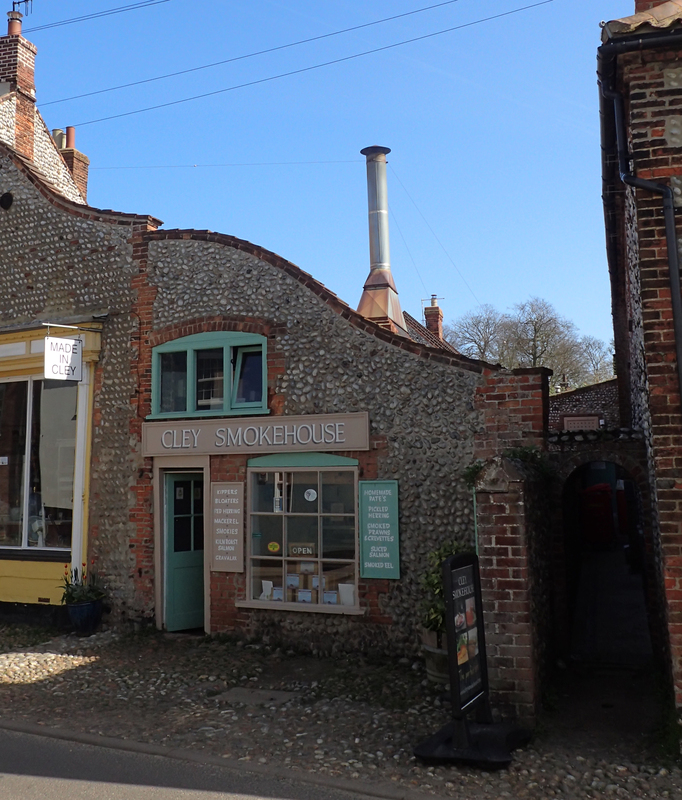 There is an alternative route that takes the walker through the village of Toddington, I never followed that alternative. 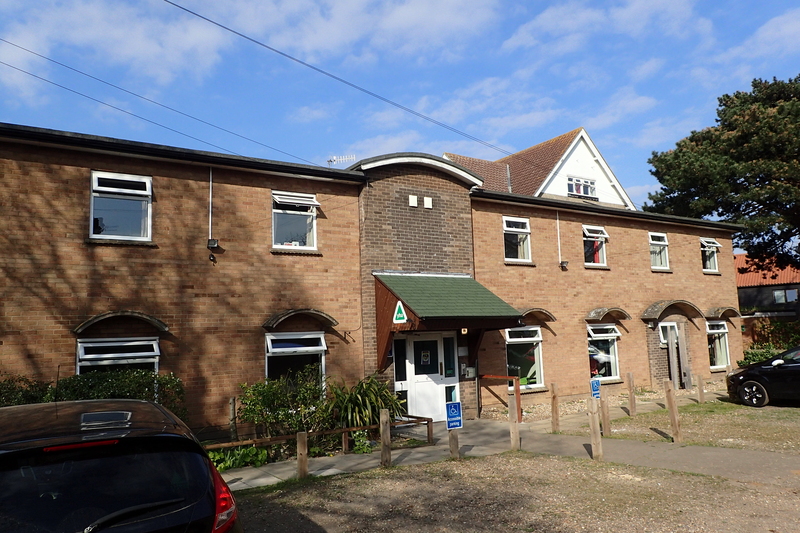 Also, there is a link whereby the walker can stride directly to Thetford with its transport links. 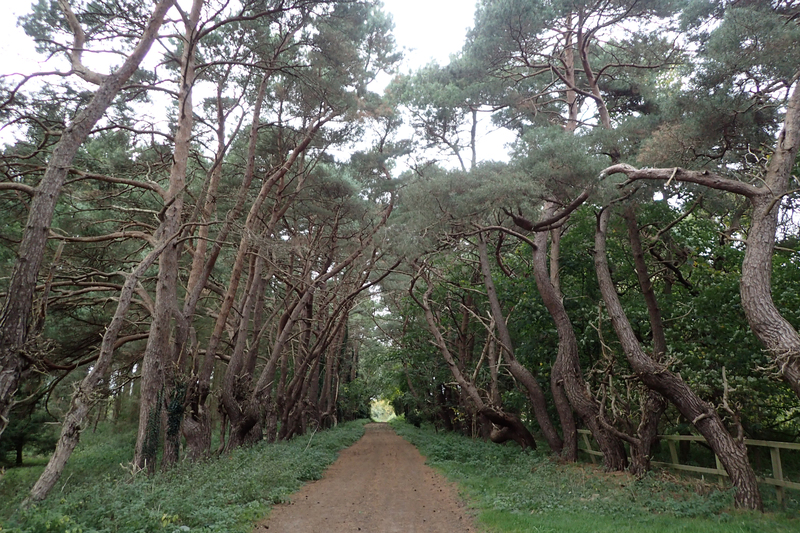 Instead, I followed the path to Knettishall Heath so as to finish where I had commenced my Peddars Way walk. 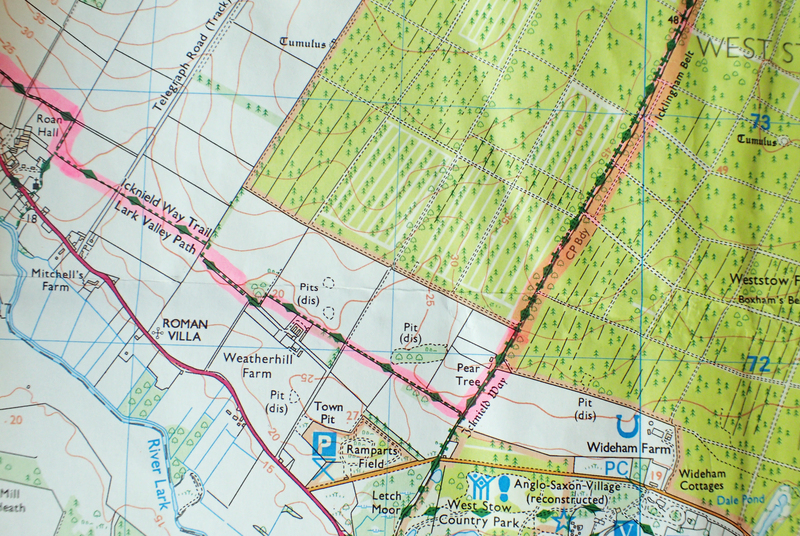 In 1992, the Countryside Commission designated the Icknield Way as a Regional Route, connecting The Ridgeway with the Peddars Way, it is this route that is shown on O.S. 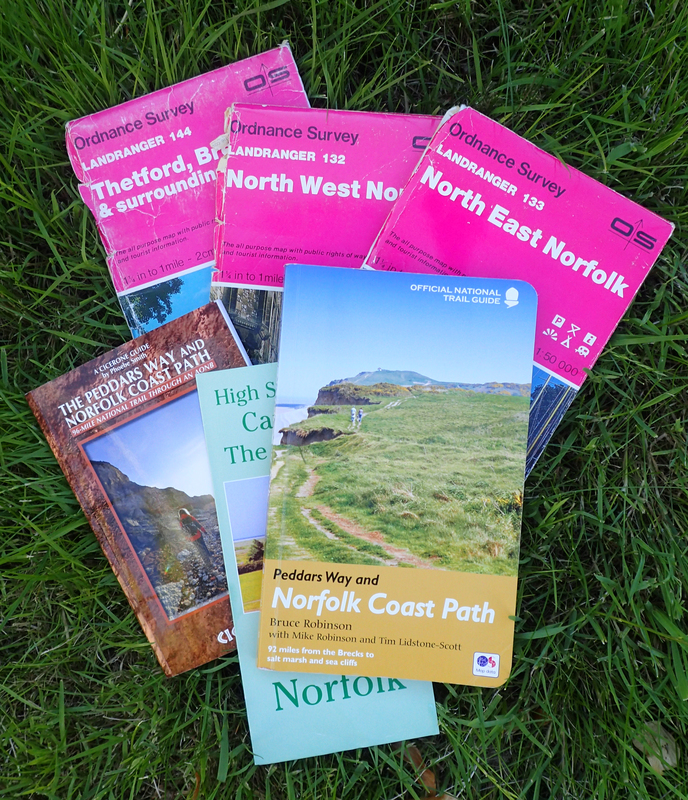 maps and is mostly signposted. 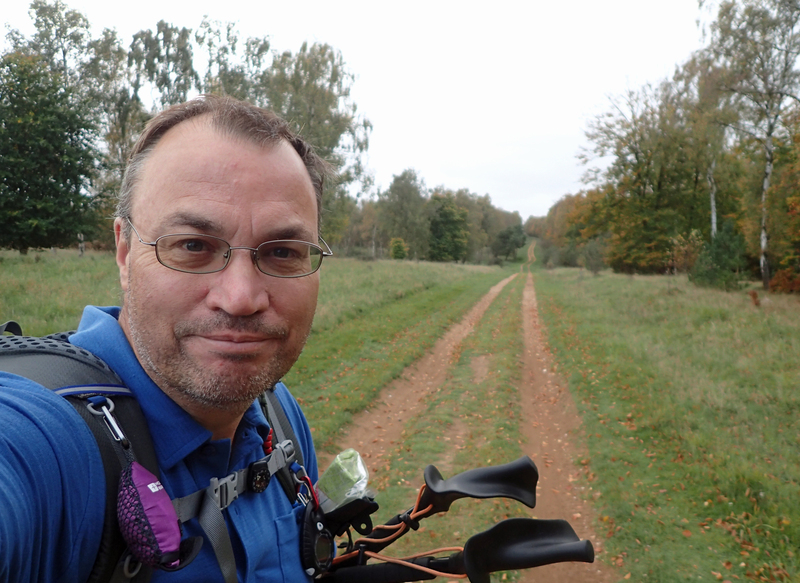 My trail ran through six counties and some lovely gentle country, including the Chilterns and Brecklands. The weather was mostly kind to me. Day temperatures varied from 6°C to 20°C (43°F – 115°F), but dropped much colder at night after a warmer first night. 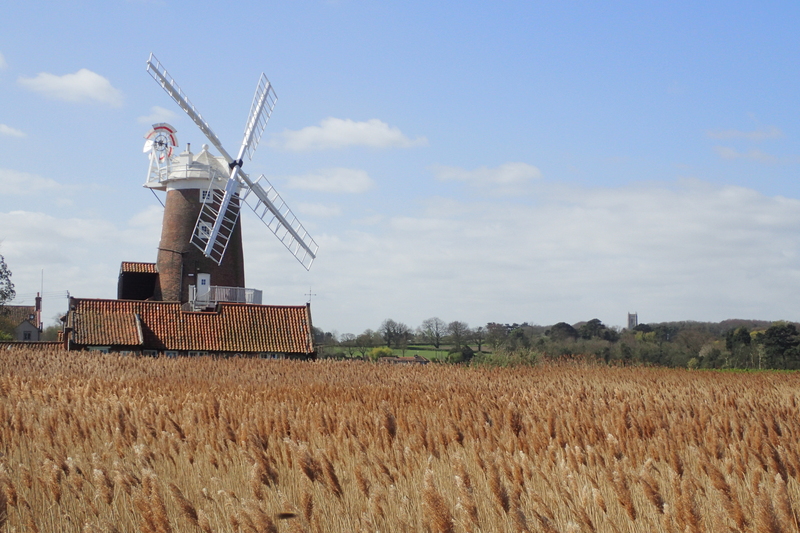 However there was often a stiff breeze which dropped the temperature considerably. If it was blowing, my Montane windshirt over my Rohan polo shirt was always suffice to keep me warm. I experienced little rain during the day and it rained briefly on just two nights. 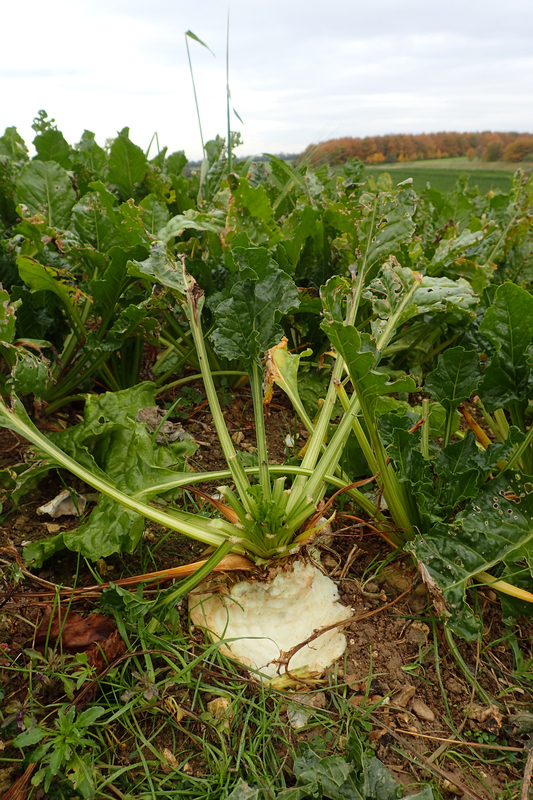 I found the trail underfoot almost always good with a few notable exceptions as a result of the farmers putting their fields to bed. 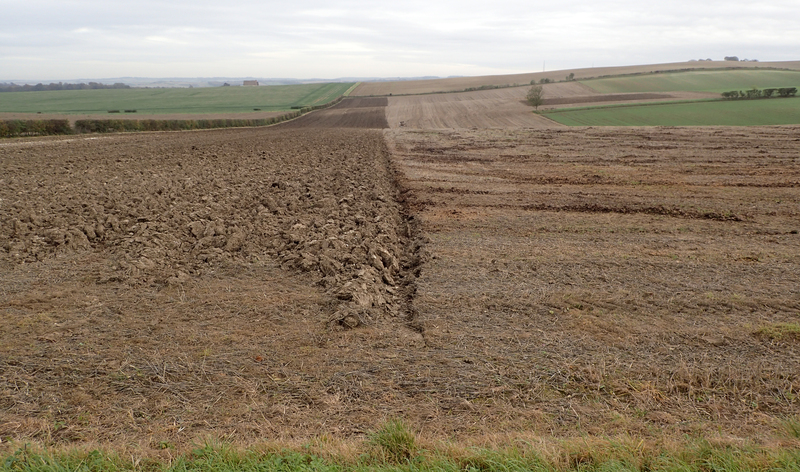 It paid to keep an eye on the map where the occasional short detour meant that crossing a freshly ploughed field could be avoided, though that wasn’t always the case by any means. As mentioned previously, this closely shadows a route followed by man for thousands of years. 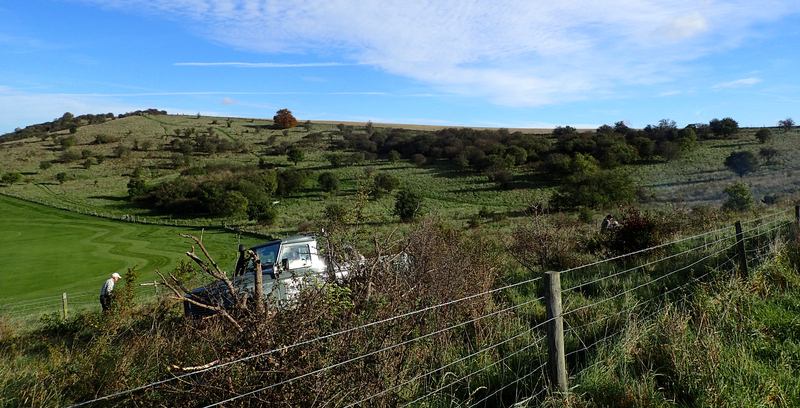 While I encountered far fewer tumuli and ancient sites than those seen on The Ridgeway, nonetheless, there were a few sites of interest passed. 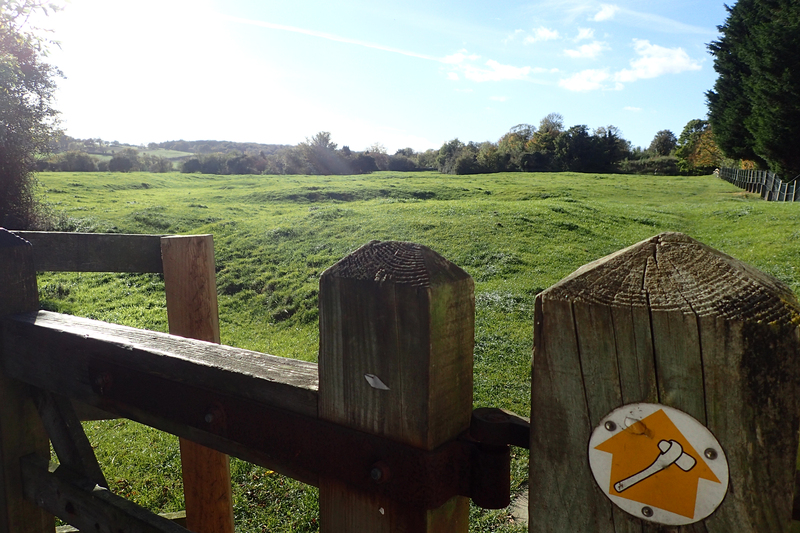 Burial Mounds were most prolific- there are over a hundred surrounding Royston. Near Stechworth, the Icknield Way Path briefly followed the Devil’s Ditch, a striking Ancient feature, up to 6m wide with a rampart some 9m above it. 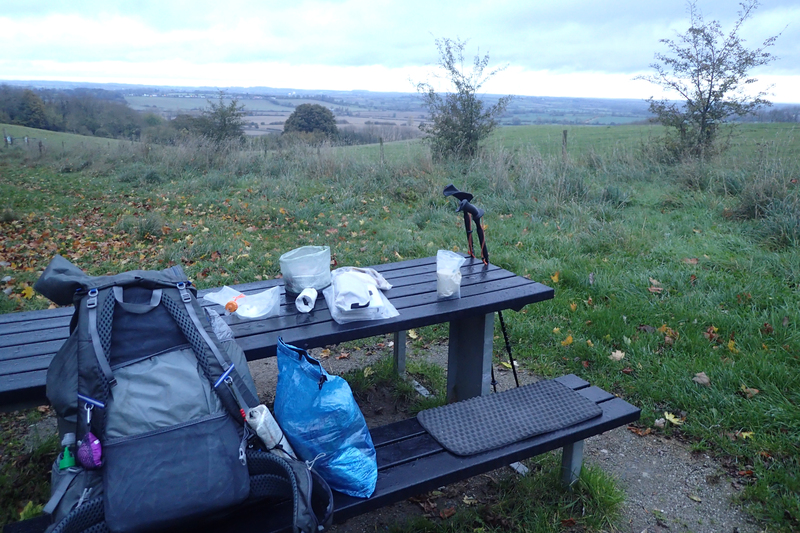 Wild camping the whole way, needless to say, ablutions were at the most basic. Keeping up a decent pace and working hard, it is fair to say that I stank to high heaven when I finished my walk six days later. This was mostly due to the fact that, perhaps surprisingly, water can be a struggle to find. I never took a filter with me as agricultural run-off is rife and there was no way I was drinking anything that came from the many small streams. Instead I relied on finding somewhere, or someone, and filling up with water from midday onward and each nights camp meant there was enough to drink and cook with, leaving just the merest of amounts allotted for a cursory clean up of body with a cloth. 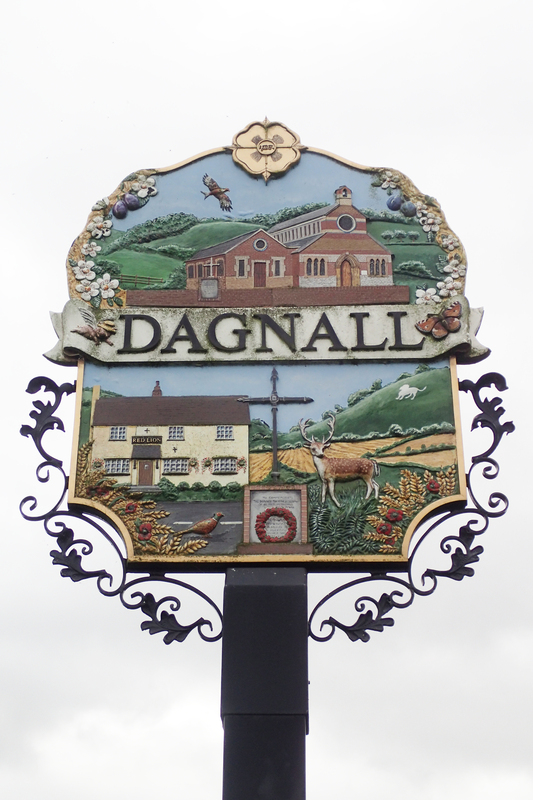 The many villages passed offered no taps for travellers and little chance to fill up. I never had to resort to simply knocking on someones door, though in one town I did pop in to a motor mechanics garage and ask them for water. 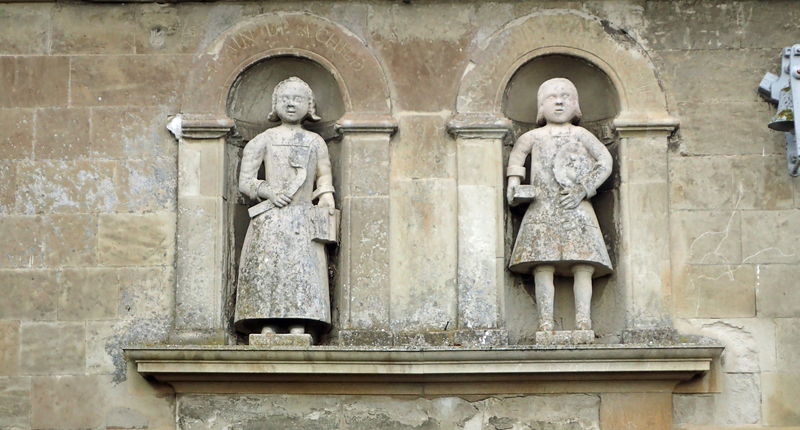 They were, of course, more than happy to oblige. 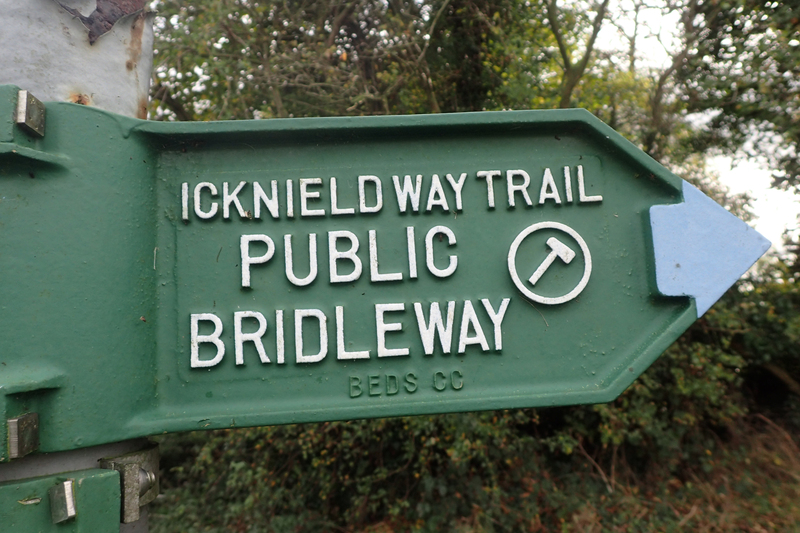 The Icknield Way Trail follows grassy, leafy, stony or muddy paths, lanes, roads, bridleways and byways, and was never hard going. 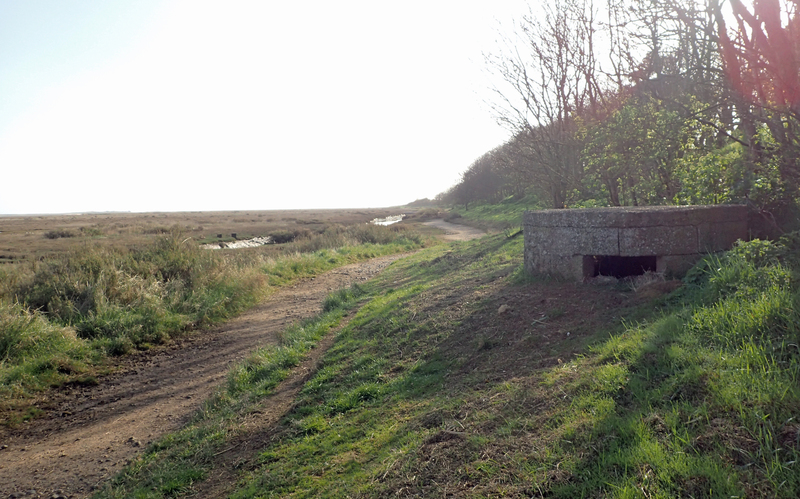 I found this particular route of less interest than both The Ridgeway and Peddars Way. But still, it was an excellent trail for a decent leg stretch over a few days and provided opportunity to try out a few pieces of my kit. 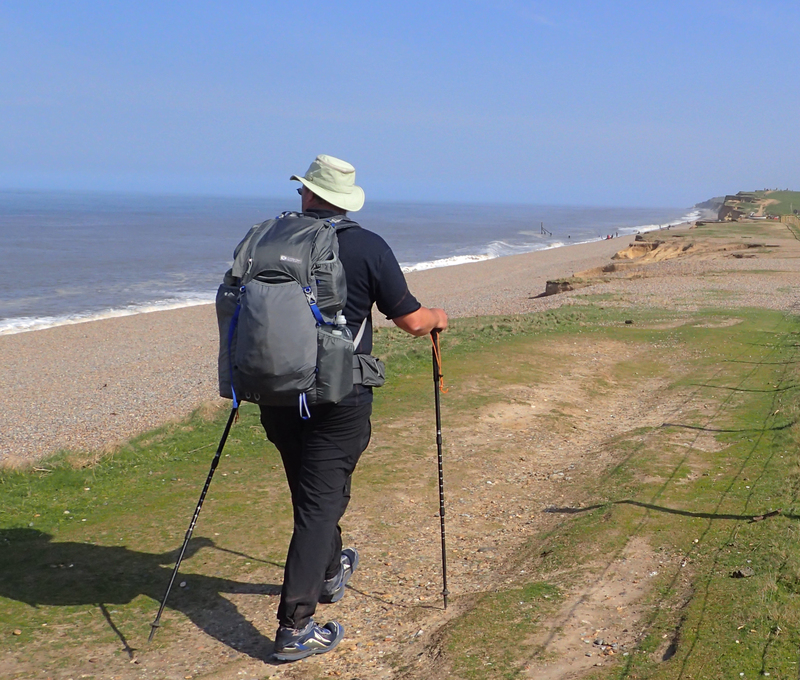 I suffered one particular piece of kit failure that resulted in some back pain. Painkillers (Vitamin I) were taken on one day but I never had to resort to them again. I’ll cover that particular problem and subsequent fix in my follow up gear report later. 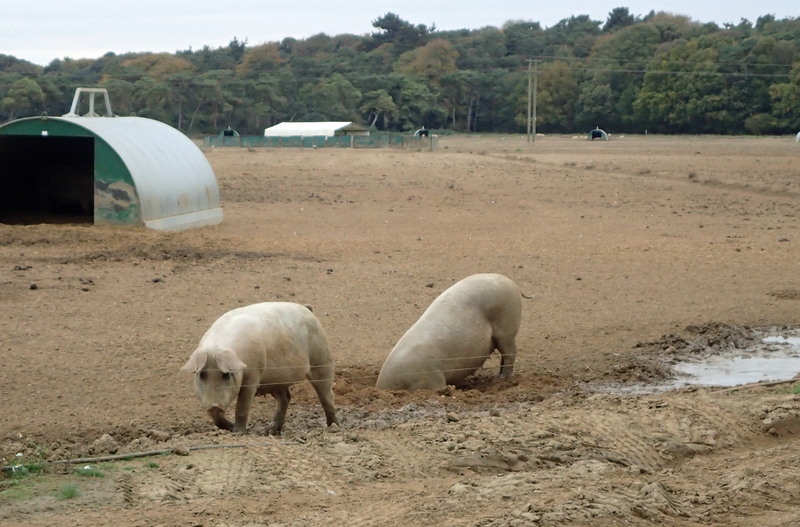 I always derive pleasure from walking in the Brecklands and the trail passed into these on day five. Deciduous mostly gave way to Coniferous, the paths became sandier and the air perhaps just a little more fragrant as I began to pass numerous pig farms. Sadly, my time here also coincided with a large number of off-road motorcyclists and quad-bikers on the By-ways. The great majority showed great courtesy to a pedestrian, the minority seemed to want to kill me. 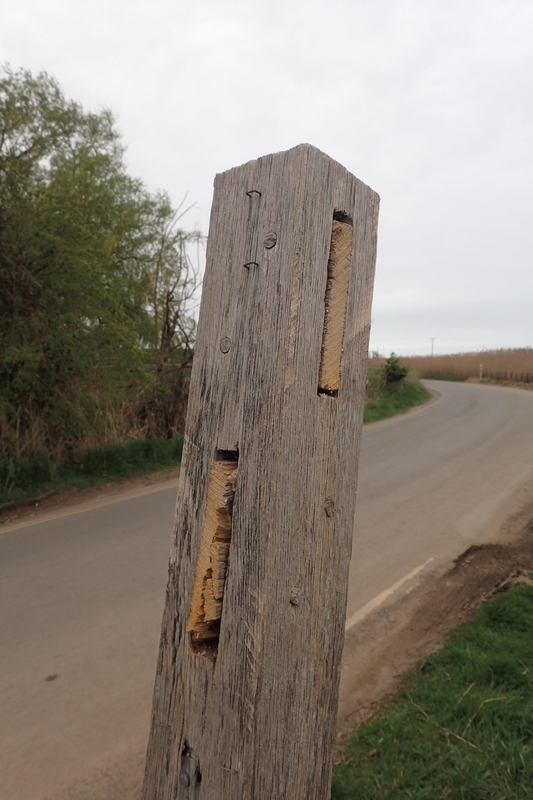 The economic disparity of the countryside was only too apparent on this walk. 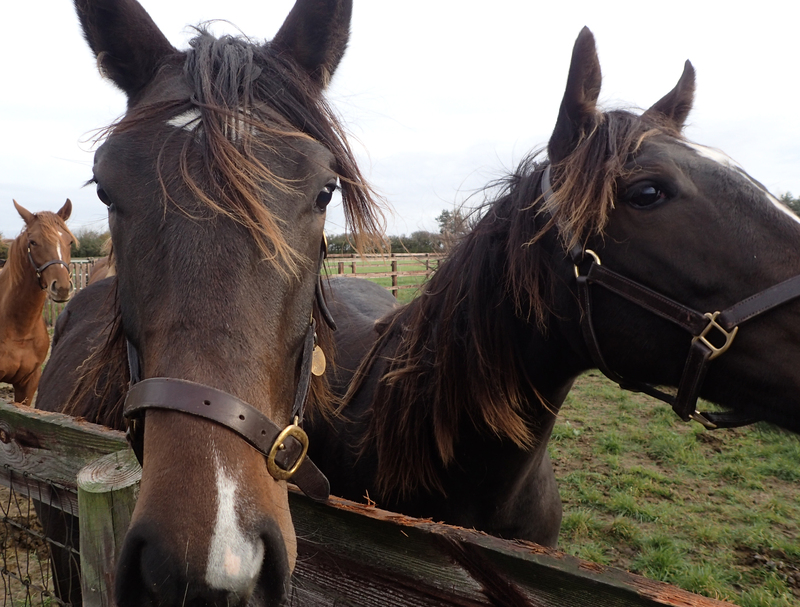 I passed horse paddocks where a few million quids worth of stud pranced. 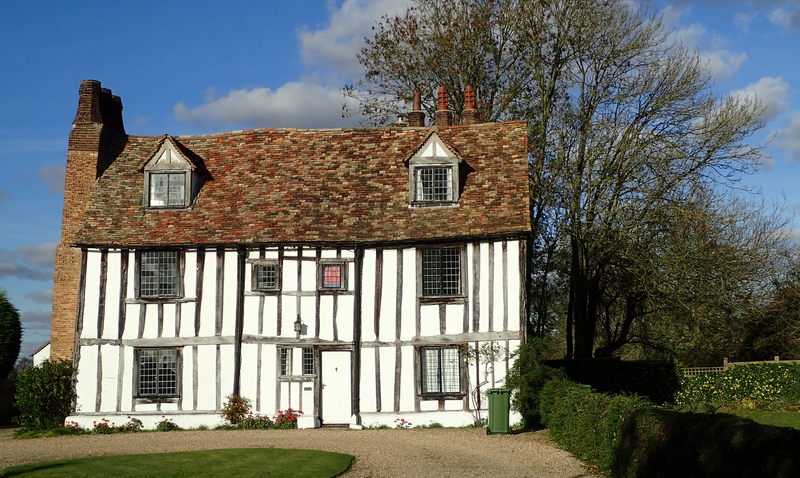 I was only a few miles from the famous horse racing town of Newmarket where James I was pivotal in starting the ‘sport of kings’. Only a couple of miles distant, lonely hamlets vividly indicated a lack of employment and hardship. There was often a helicopter in the air on the final two days and I wondered how much of the overseas money filtered into the local economy. Would I do the walk again? No. Would I recommend it to others? Again, no. Unless you are completing the entire Greater Ridgeway. In that case I think you would find sufficient of interest to make it worthwhile. 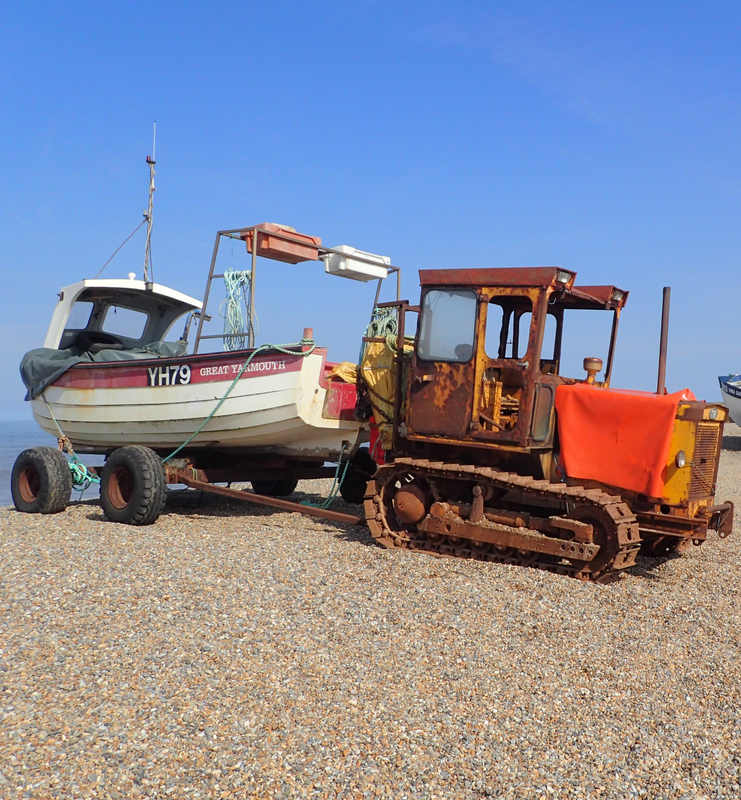 This entry was posted in Uncategorized and tagged camping, Clothing, Food, gear, Greater Ridgeway, Icknield Way Trail, navigation, Norfolk Coast Path, Ridgeway, route on November 20, 2017 by Jools. 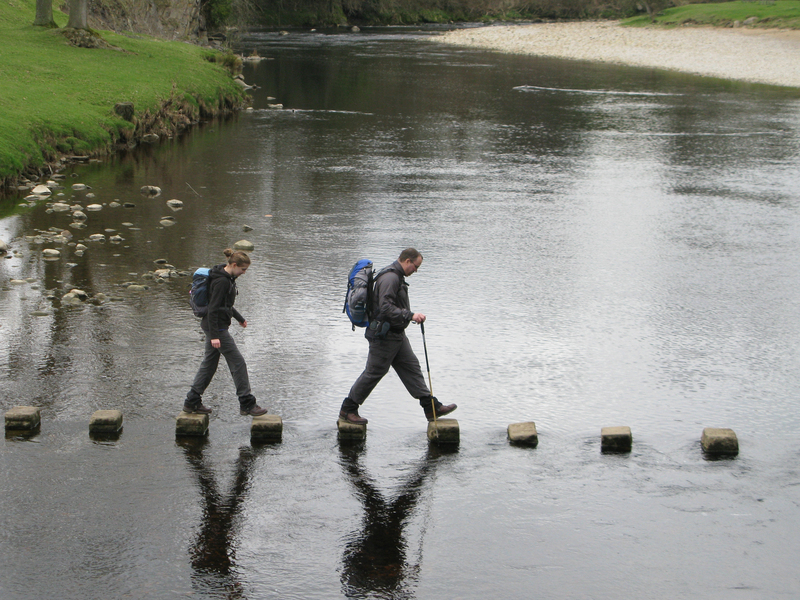 Over the years, Three Points of the Compass has struggled over what camp shoes to take. Some hikers eschew the inclusion of anything beside the boots or shoes they hike in, me, I want to change of an evening. Synthetic trail runners in particular can really stink if wet. 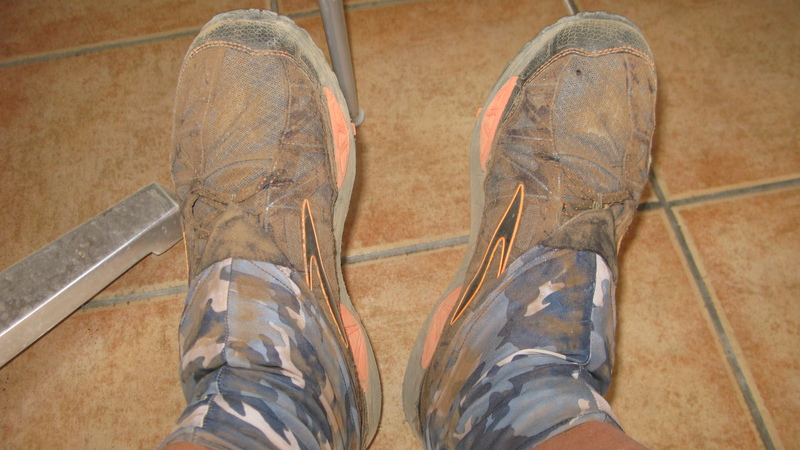 I want to get my feet out of my trail shoes or boots, cleaned off a bit (or a lot), dried out and rested. If I am staying at a B&B, any owner is going to take a dim view of muddy footwear going any further than the front door. If wet on the trail, you can be caked in mud and if I am on an official camp site, I don’t want to be trailing that into any w/c. Finally, many Pub landlords want walking foot wear removed at the door, as do some cafe owners. 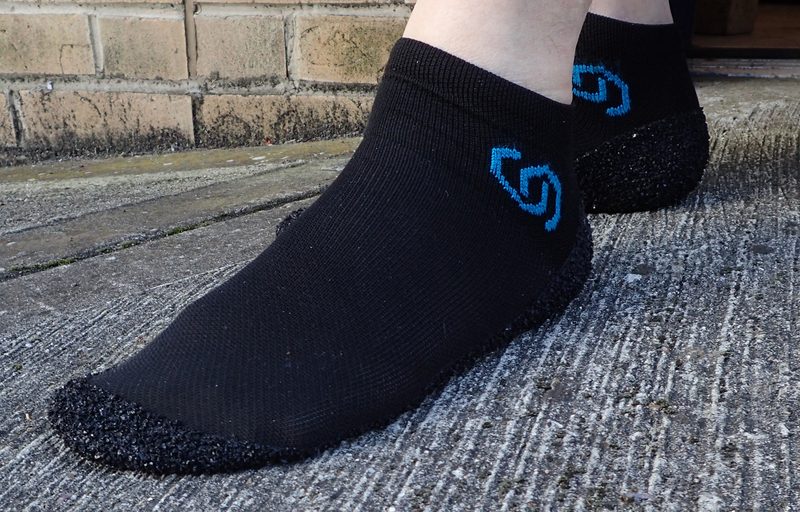 If I am staying in a campsite or hostel where I am sharing a shower room or block, I also want footwear to reduce the chance of contracting anything nasty off the floor. Put that little lot together and a spare set of footwear it is. However just about everything I have tried is either downright ugly, heavy, or both. I loathe Crocs with a passion, but even if I could put up with their appearance, they are simply too bulky and I hate things dangling from the outside of my pack, which seems to be most hikers answer to the bulk of a pair or Crocs. Flipflops can be lightweight, but I don’t want to be wearing those for walking a mile down to the neighbouring village. I have tried wearing a pair of waterproof Sealskin socks inside wet and muddy trail runners but these begin to leak over time. However, that said, wearing a pair of Sealskinz, the heat from a dry pair of feet can help dry out a sodden pair of shoes or boots. Three Points of the Compass was intrigued to come across a nifty design of footwear recently and decided to take a punt on a pair of Skinners. First appearing on Kickstarter, these are handmade in the Czech Republic and are made from Polypropylene, Viscose, Cotton and Lycra, they also have silver in the antibacterial yarn to reduce odour. 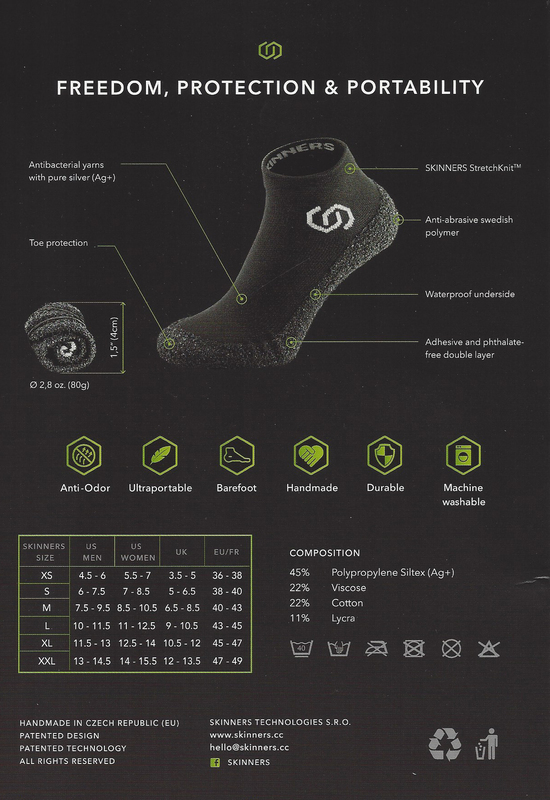 Put simply, they are a stretchy, breathable sock with a waterproof abrasion proof polymer stuck on to the bottom and sides. There is no stiff sole and the socks/shoes roll up for carrying. They come supplied with a little cloth bag but I don’t need that as there are lighter options. I ordered online, took the advice of a couple of reviewers and sized up to an XXL (I have feet size 11/11.5 UK), so the ones I ordered were supposed to fit feet size 12-13.5 UK. I should have ignored the advice and simply ordered the correct size as the XXL were way to big. The XXL I emailed Skinners to request an exchange for weighed 203g (7.2oz) for the pair. My new pair of XL fit me just fine. These weigh 183g (6.45oz) for the pair, so 91.5g per single sock. Pretty good compared to just about every other type of footwear I have taken with me for camp use. However, it remains to be seen how these will perform when used in anger. I really am not sure how I am going on to get on with what is, effectively, a toughened pair of socks. This entry was posted in Gear, Uncategorized and tagged camping, Clothing, feet, Footwear, gear on October 6, 2017 by Jools.